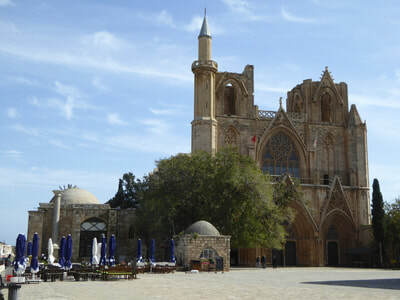 ​This year, we sailed from Cyprus through the Aegean Greek islands to the Northern Greek fingers and back to Cyprus. 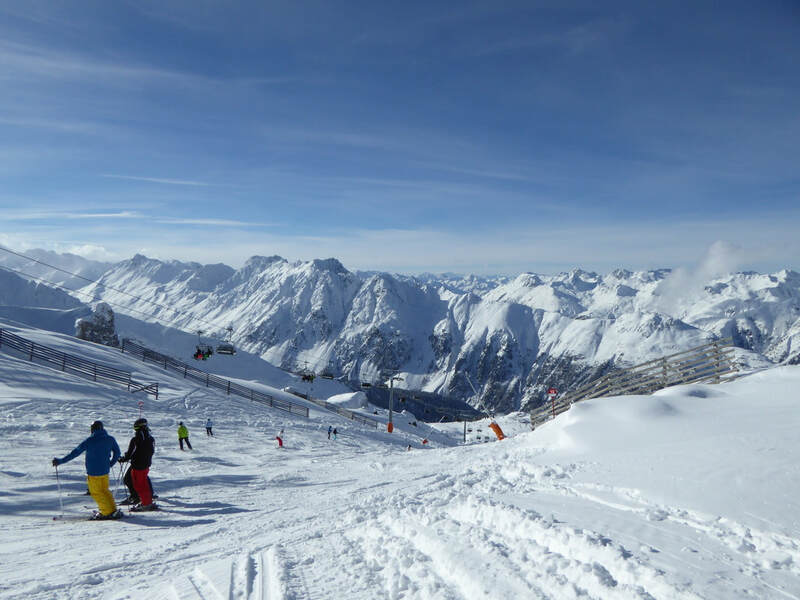 Our land tours were in Canada, The Netherlands, skiing in Ischgl, Austria, Northern Greece to the Albanian border, Cyprus, and the Turkish occupied northern region of Cyprus. 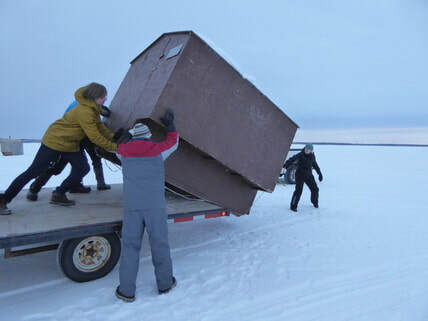 The family piled into the vehicle and took off to Tobin Lake with the ice shack in tow, joining about 40 others “possibly a record for the lake,” son-in-law Kris said. Weather is frighteningly cold, warming from -45 to -25ish. They set in in place ready for fishing the next day. We drove back to Carrot River for lunch, thawed out our feet, and were off to Nolan's second hockey game for the day! Weather in Carrot River: -46. 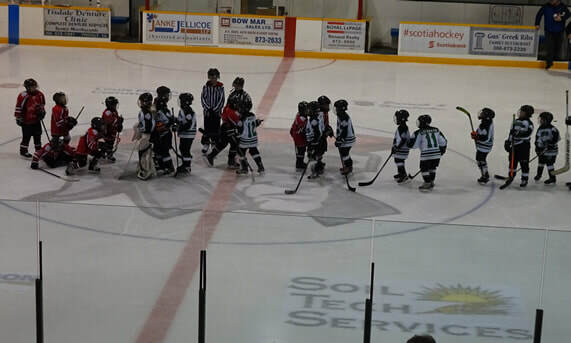 Poor Con nearly lost his feet to frostbite, and that was INSIDE the rink this morning! The next day, Con, Brit, Kris and Nolan returned to do some fishing. I opted to remain behind not feeling 100 percent. They drilled round six-inch of so holes in the bottom of shack through the snow and ice and drop their lines in. 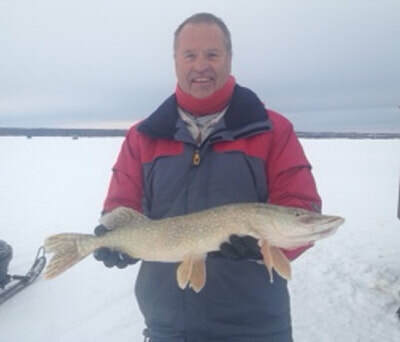 Con pulled out a Northern Pike, one of the biggest fish caught out there, and that’s no fish story. January 14 -- Following a week in frozen Saskatchewan, we were back with Hailey and Dex helping them work on some chocolate Christmas creations. Another visit to see Lindsey, Les, and three-month-old Kate, we flew to Ontario for a few days with Doug and Merrilee and also to present again at the Toronto Boat Show. Our topic: "Demystifying the Med". It was well received, and I sold lots of books.. The audience there is familiar with the Caribbean, and we introduced the idea of sailing in the blue, warm waters of the Mediterranean where they could enjoy the diversity of people and their history, churches, mosques, castles, villages, capital cities, exotic foods, dizzying array of language and culture, etc. etc. My book Sailing Through Life" sold out before we completed our shows. Right after our last show, we taxied to Toronto Pearson Airport and flew to Munich, and boarded the train to Innsbruck, Austria. Next stop: Inschgl. 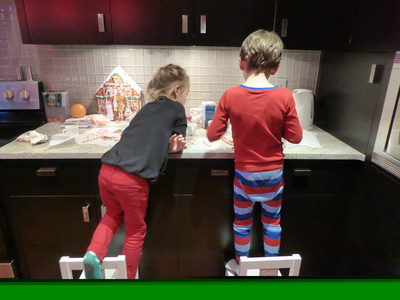 With "half board" we’re enjoying a five-star breakfast and gourmet dinner each day. After skiing, we went into the sauna and steam area learning entrance is WITHOUT bathing suits. We wrapped ourselves in towels and enjoyed the whole experience. Afterwards, we dressed up for a succulent dinner creatively presented. Our set table overlooked the main ski run and while we ate, we watched the groomers clean the hill under the night lights and under the spray of fresh snow from the snow makers. Con struggled with a flu bug, and unfortunately spent a few days in our room. 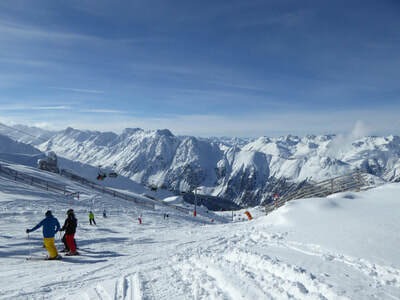 In the Alps a person can ski from Austria to Switzerland. 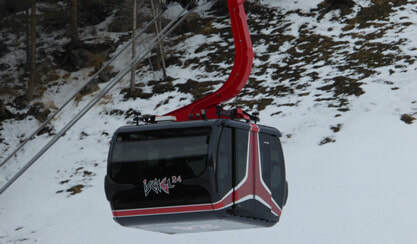 The area is set up with lifts crossing borders, with buses and trains that transport skiers with lift tickets. I armed myself with the mountain maps and memorized the 1A train to get back to our hotel, kissed Con, and set out hoping not to get lost. Con is still under the weather and remaining in the room. We have a beautiful balcony that overlooks the slope and each time I ski it, I wave wondering if he’s well enough to venture out. Luckily the flu hasn’t affected his appetite and at least he’s enjoying the gourmet food. 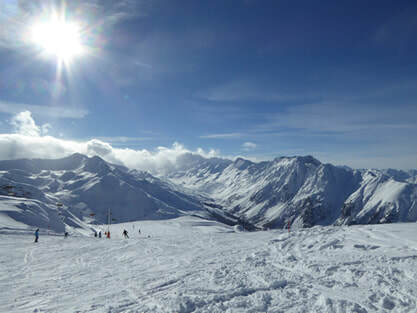 I am in awe at the gorgeous skiing here. Fresh man-made snow continues to be sprayed and the conditions are deep powder on moguls. This area is so different from the Rocky Mountains and BC’s Whister coastal mountain area I’ve skied. 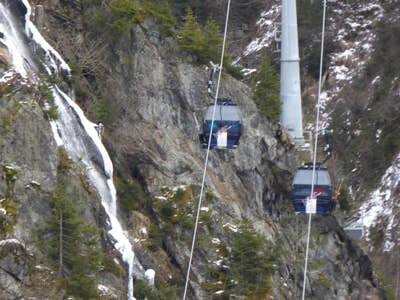 The gondola from our hotel is completely enclosed insulating people from the weather. Once lifted the chairs on the slopes are long and broad rather than vertical. Temperatures hover at +3. A lady undid her ski pole handle and poured schnapps into the handle and passed a shot around the gondola (to her companions). Others had flasks and passed shots. By the afternoon, the gondola rides were getting pretty animated. Still solo skiing while Con fights the bug. Remaining near the hotel so I can periodically go in and check him, Con said, “Go further.” So I did. I skied to Switzerland! I had been exiting the lift and skiing left and then turning right back down to the hotel. This time I continued straight, veered right and was astounded by the view. I could see across the ski valley. The sun was sparkling off the fresh fallen snow, and lifts were operating in every direction. Music was playing from one of the chateaus. 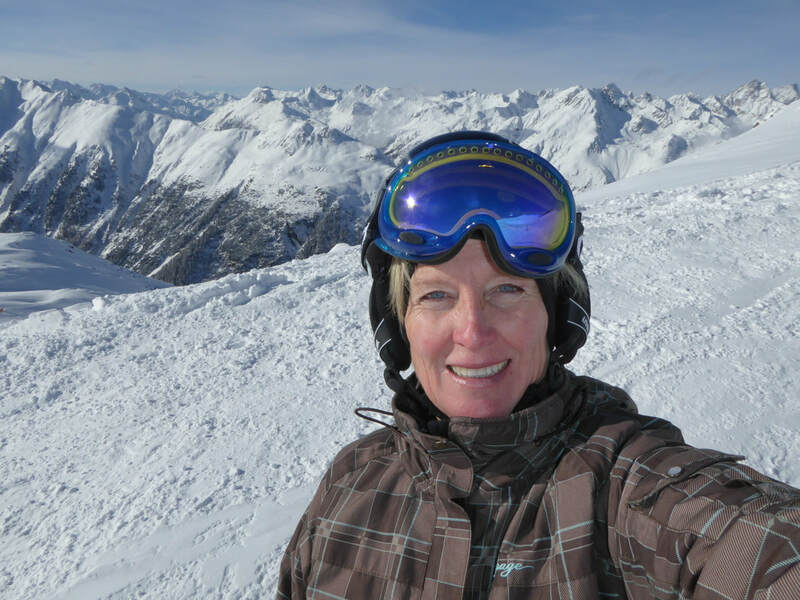 I skied to the lift where my map indicated, “Switzerland” and was lifted up and over the Alps. I was on top of the world! I couldn’t control my joy, it bubbled out of me. I skied all day with an enormous grin on my face, not once getting lost. 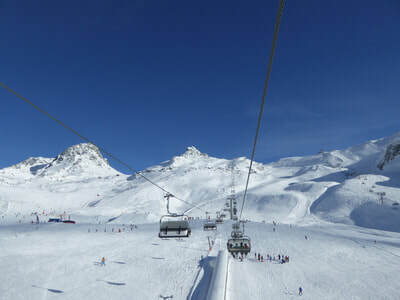 This was now my eighth day skiing and the eighth perfect day in Ischgl. I feel enormous guilt enjoying myself so much while Con still fights the flu. I’ve been testing my courage and skills on all the runs challenging myself on the black ones, and feeling complete bliss. 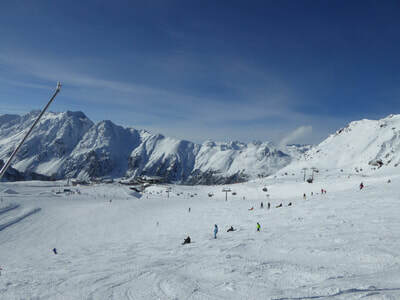 The wind has swept some of the powder off the very tops of the Alps, so I’ve learned to avoid those areas. I’ve taken video while descending so you can join me on the slopes. At night, there was a Ski Show on the hill. Hordes of people gathered around the hill. We sat on our balcony wrapped in our warm housecoats and watched. 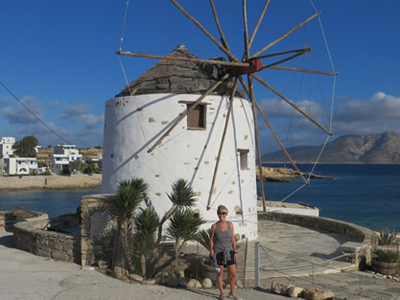 January 30 – Following six amazing weeks in Canada and Austria, we’re back aboard in sunny Cyprus touring the northwest (Greek) part of the island. The forest never ended! Once we entered, we drove for 10 hours unable to exit until the sun was nearly setting. Apparently the forest is disappearing due to pastures, urban development, and forest fires, but you'd never know it from our trip. The road winds around the mountains until it finally spits you out near Limassol. I was making plans to spend the night in the car if we didn’t get out that night! 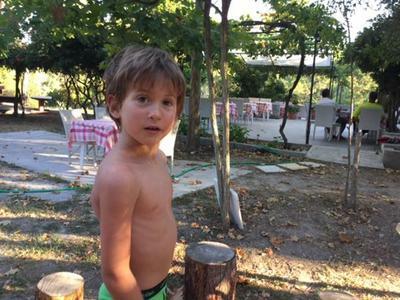 Con had received an email from the customs person in the office 50 meters from the boat. She asked, "Why haven't you checked in here yet?" (And she meant all the way back to September, not when we arrived back in Cyprus two days ago.) We were baffled. They both now stared at each other. The agent glanced out the window at what was becoming awful weather and offered, “Maybe you could apply for a temporary import license for the boat and I could do that right here." She went on to explain that there would be no extra cost or tax. We have no idea what sort of bureaucracy that was all about, but Con agreed, and according to the agent, we are legal in Cyprus. 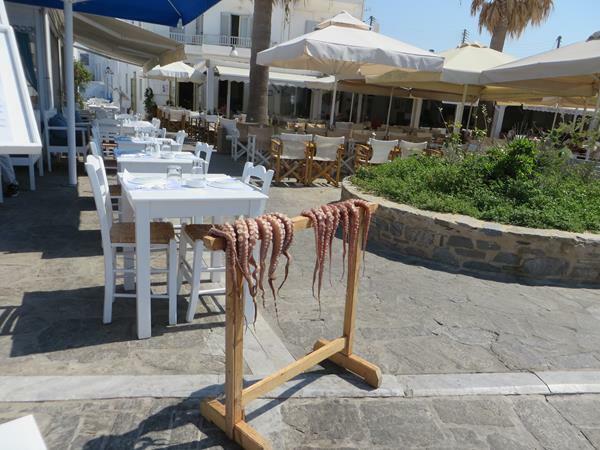 Why Cyprus has different laws/guidelines from all the other countries in Europe is the mystery of the day. We stopped at a small store where delicious 70 euro cent oranges were neatly arranged outside the window. An old man, possibly in his 90s was seated in a chair facing the oranges. "Kalimara," I said. The old guy lives down the hill and walks up this street every day, passing my shop. Today, he wanted to stop and look at the oranges and the old man said, "I'm very happy. I will stay right here today and die." The grocer made sure he was comfy and brought out the chair, turning it toward the oranges. The grocer told me that the old man is a refugee, like most of us here (since 1974) but life was hard for him. 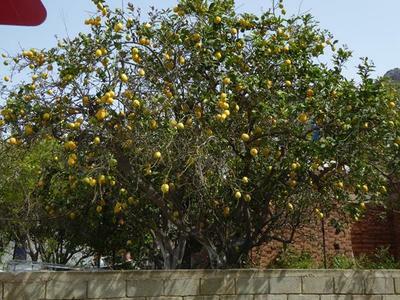 He lived in northern Cyprus and had so many orange trees, thousands of oranges every season. Now he has nothing, so I made sure today that he is very comfortable, because you know, one day that may be me. Well, even in paradise we have to tackle health issues. Con's been struggling with his cold for nearly a month and now has an infection in his ear. We cycled passed a doctor's office; although his waiting room was busy, he saw Con within minutes, and 35 euro later, Con had a pocket full of prescriptions. Our next stop was the dentist to follow up on a tooth that's giving me trouble. 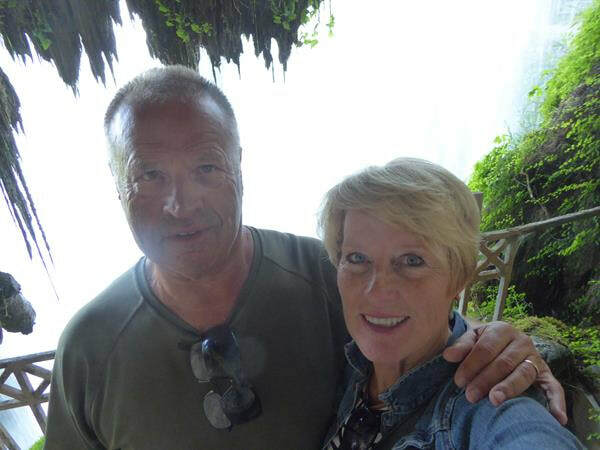 The long story short: three years ago I started taking a hormone replacement every day and thereafter struggled with debilitating migraine headaches, not aware at the time that they were caused by the medication. Attempting to dissect the cause, in Canada I saw an Ear Nose Throat specialist (took about eight months to get in) had a Cat Scan (took nearly a month to get in - on a rush) with the conclusion: chronic sinusitis. Still chasing why I’d have that, I saw an allergist. Nothing learned. The sinusitis played havoc with my upper molars, so I had a root canal in Valencia hoping to solve that, but the migraines continued. In Cyprus I had a beautiful crown put on that tooth. Finally, process of elimination, I stopped taking the hormone replacement, and for the most part, my headaches have subsided. February 6 – Happy Birthday to my wonderful husband. 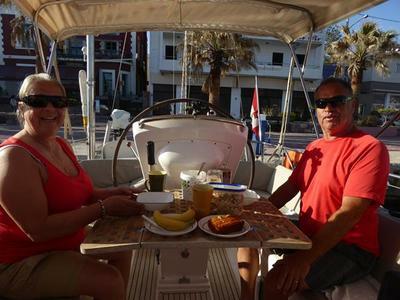 We celebrated together on the boat with a delicious home-cooked meal. With the sun shining lovely and warm, we walked into town taking in the Limassol weekend ambience passing the paper mache people lining the streets, the sidewalk cafés filled with friends and families gathering, boys and girls scouts collecting food for homeless, and dozens of protesters outside a government building protesting the Turkish occupation. 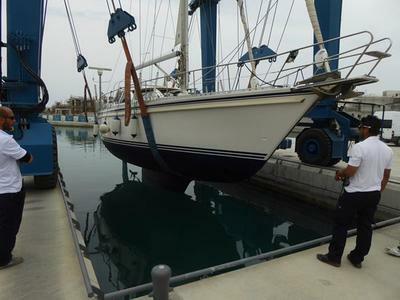 February 7 – The Limassol marina is filled with empty boats, many super-sized yachts, and every other day or so a mega yacht arrives for a few days. The live-a-board community is made up of a full-time live-a-board British couple who keeps to themselves, and us. February 8, 2015 -- The screen shot from my charts show the low Tuesday morning in central Turkey from weather pushed south from the Black Sea through the Aegean will run ram shot over Crete pushing east toward Cyprus. The Aegean will be kicking up 7-meter waves. Captains of the freighters are seeking shelter just off Cyprus and in the harbour just west of Limassol. The red flag just below the "Athens" text indicates 50 knot winds, so imagine how fun that would be out there, since it's ALWAYS more with gusts. 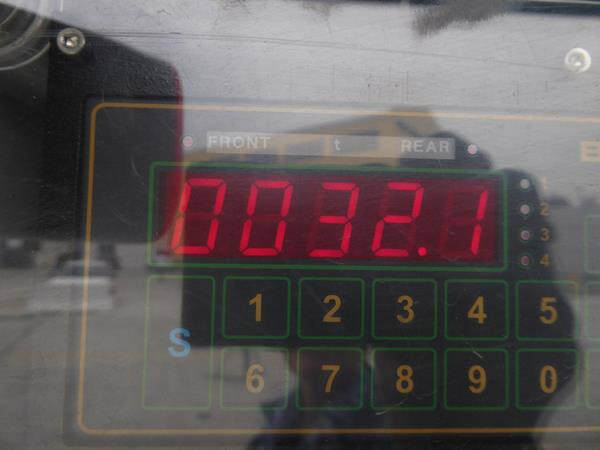 February 10 -- Clocked 64 knots! Big Sky is likely tucked into the calmest position in the marina, behind the three-story marina office building and on the east side of a 62-foot catamaran (a wall of a boat!). Despite that, we clocked winds in the 60s on our wind instrument today. Getting off and on Big Sky was a challenge, balancing down seven steps at the bow to the pier as the wind threatening to blow us off! Big Sky was heeling dramatically, so we took ourselves to Wagamama a sushi restaurant and later to the gym. Bigger winds arrived later in that evening. I prepared delicious creme brulee thanks to Albertine who gave us the package from France. The next day, Con dipped his feet into the 19 degree water. It’s slowly warming. One hundred NM behind him is Beirut, Lebanon. 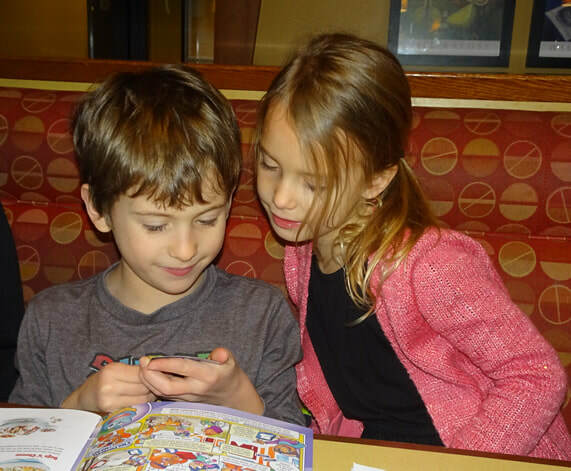 February 16 -- Grandson Nolan turns 7, and we remembered my mom, who would have been 88. 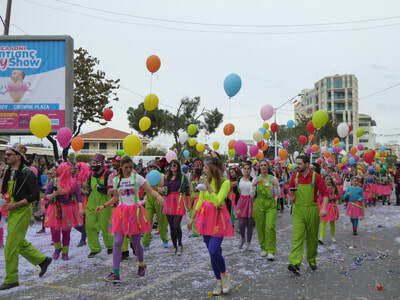 It’s the Children's Parade in Limassol, during Carnival month and we believe every child in Limassol participated in it! It was a joyful time in the city. Bystanders aren’t exempt from the spirited custom of spraying coloured sticky stuff from cans, or spraying shaving cream, and tossing handfuls of shredded paper on everybody. At midnight temperature outside was 1.7 inside 11.4. Snow fell everywhere on the island except some of the coastal cities, like where we are. When the sun came out, so did we, walking the long sea-side promenade and then into the town finding a cozy table in the sunshine and ordered two tall glasses of freshly squeezed orange juice. 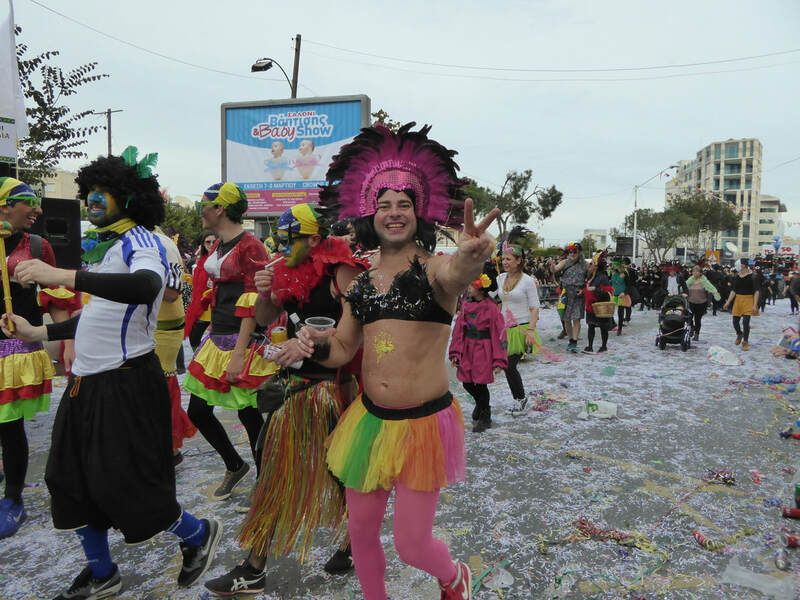 We set out two hours too early for the final day’s parade and stopped at a restaurant, surrounded by Carnival-dressed-up locals, and asked “mama” the proprietor for a menu. With her hands on her ample hips, she said, “This is a local restaurant. What I cook, I serve.” We had meat pies in filo pastry. 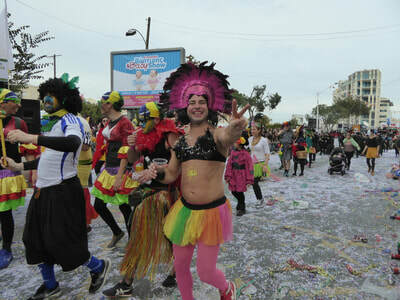 Meanwhile, temperatures continued to drop, and by the time the parade started, it was about 15 degrees. 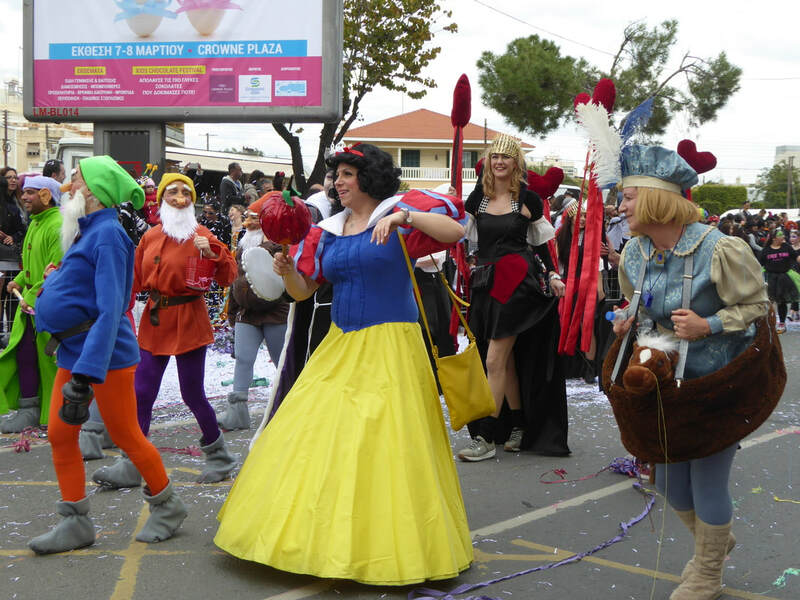 Hundreds of Cyprians took part in the parade, dressing in elaborate costumes and the purpose of the carnival is: to have fun. Sponsorships and advertising doesn't seem to touch the festivities at all. Men enjoy dressing in sleazy women's clothes and wigs, while women enjoy dressing sleazy. 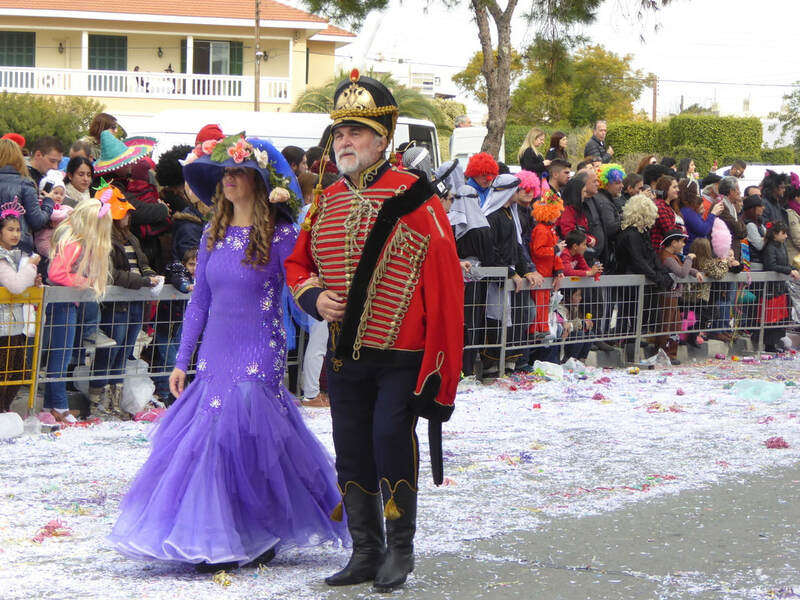 Kids enjoy dressing up as anything, and everyone of age drinks beer. As the parade was coming to a close, the crowd energy was getting higher. Con and I were sprayed a number of times with the sticky coloured stuff out of the cans, and had shredded paper tossed on us. March 5 -- Leaving Cyprus for Northern Cyprus used to be impossible but in 2004 the border crossing opened (relaxed). The 1974 war between the Turkish and Greek people resulted in the north being claimed by Turkey, and the infamous "Green Line" drawn across the island. The UN put peace keepers at that green line, including a large Canadian contingency. Only Turkey recognizes Northern Cyprus as a country by the way, but here we are in what feels like a different country. One step over the border and the culture immediately changed. 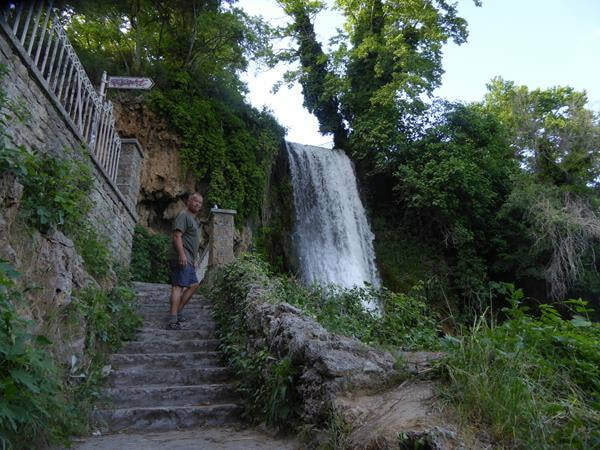 We use Turkish lire, cay (pronounced CHY) is the drink of choice (tea in glass cups), the mosques call out five times a day for prayer, and of course, the language has changed, men in baggy pants and women in headscarves. No more Gyros; now mesas. We asked the border officers not to stamp our passports just in case there are any issues upon our return to Cyprus. We were given a separate paper with a Northern Cyprus stamp on it. 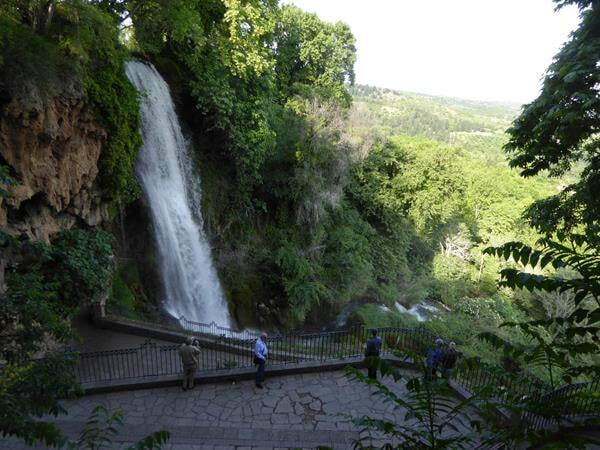 It's the same system as when we passed on foot from Jordan to Israel. 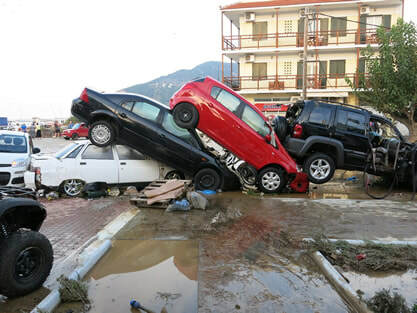 Car insurance is invalid from Cyprus while in Northern Cyprus, so we rented the car on the Turkish side. 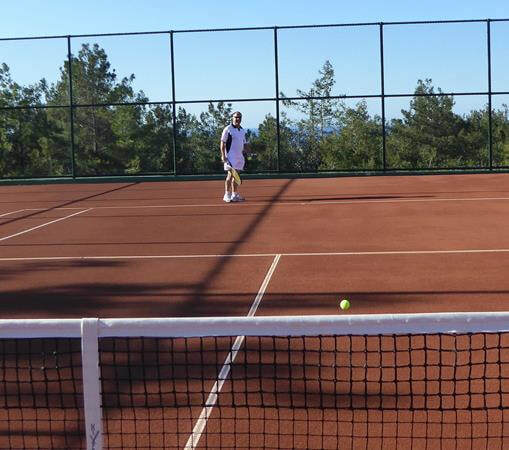 Our hotel specializes in golf and tennis and since "tennis" is our second love, we set off as soon as we arrived to play. 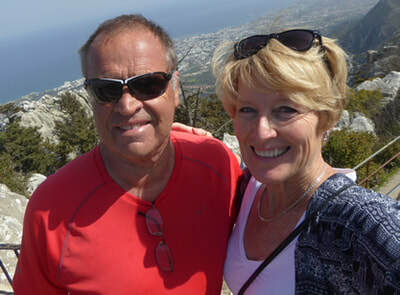 We drove to the coastal town of Girne. 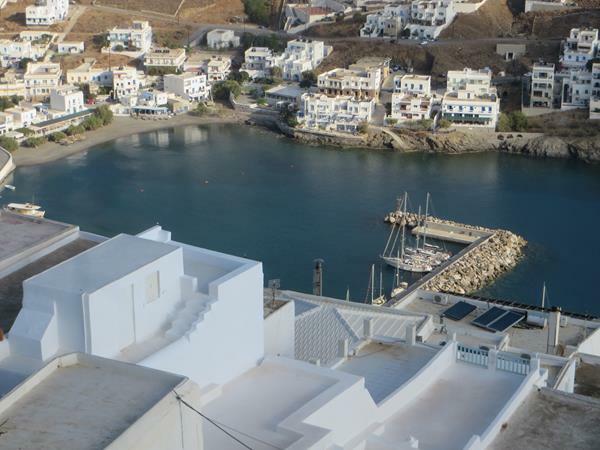 The old town is built around a horseshoe harbour with the Girne Castle guarding the entrance by sea. 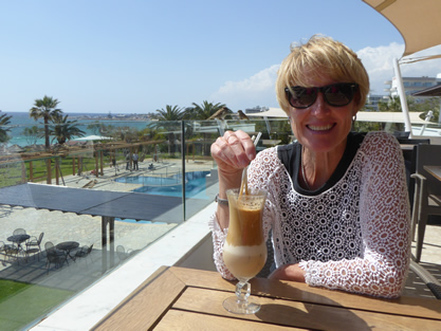 We sat in the sun sipping a Freddo Cappuccino (Greek cold coffee) watching the activities in the harbour. Another day, we drove to Karpaz (the tip of the skinny strip of land that points toward Syria), looking for the wild donkeys, 500+ of them. Following the 1974 invasion by the Turks, the Greeks left everything including their domesticated donkeys who were an integral part of the Greek farm, part of the family. The donkeys were rounded up and taken to the protected remote park. 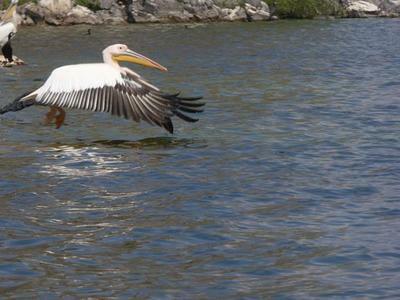 We rounded the bend and were instantly surrounded by about a dozen of them. They have a reputation for being bad tempered and intolerant, but for the most part, they were polite when we were taking their pictures, however, a bit too impatient, budging in front of each other for their turn. This one had his head right in the car wanting us to take a close up picture. 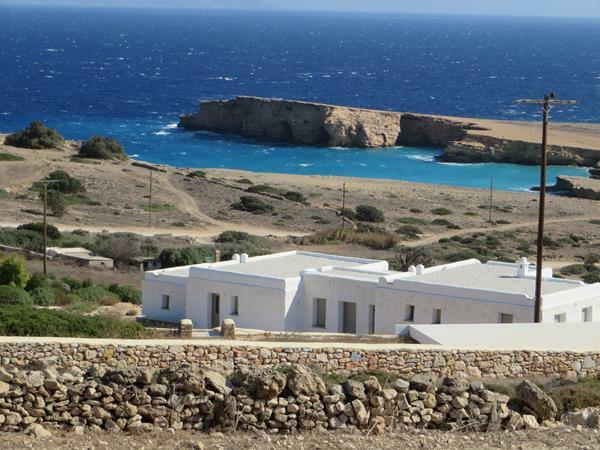 Wild flowers populate the region, making a beautiful colourful landscape down to the blue sea. This is an important area for the green turtles, one of three places on earth where they breed. They come ashore in June and July and lay their eggs in the sand and by August and September they can be spotted making their way to the sea. 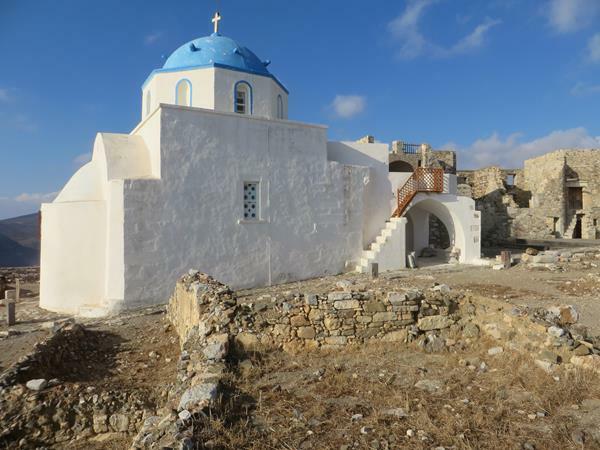 Surprisingly there was a Monetary at the tip of the island, with a Greek Orthodox priest coordinating its reconstruction. We touched the holy water and carried on. This morning, after years of seeing the white cotton-like tents in the pine trees all over the Mediterranean, we spotted the critters that build them. The Pine Processionary caterpillars. They are one of the most destructive species to pines. I rerouted them on their march toward the pine tree our car was parked under, but they got right back on course. They are extremely harmful to human skin if touched. They are the larva of the moth they will become when they burst out of the tent. 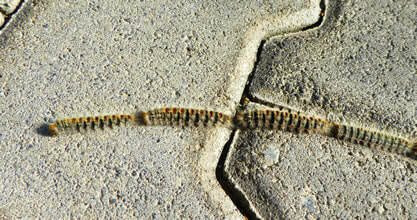 The group was about a meter and a half long, each caterpillar about 3 cm long. Reading Victoria Hislop's book, "The Sunrise" gave us great inspiration to visit this once vibrant holiday destination location, Famagusta. Her book centers around the conflict between the Greeks and Turks, written in a beautiful way from the perspective of a few families caught in the crisis. 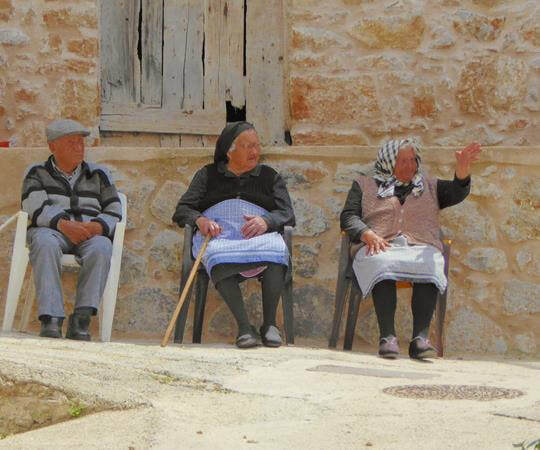 In 1974, when the Greeks left the city believing it was for a few hours, maybe a day or two, has now turned into 40 years and counting, they left everything behind. There's an area right of this picture called "The Ghost Town" a once elegant district including beautiful hotels and luxury apartments and houses, prestigious shops, restaurants, all mostly owned by Greek Cypriots. The beautiful hotels lined the white sandy beach and prior to the invasion was a tremendously popular vacation location. Once the invasion began, the properties were looted and soon after completely sealed in what is now rusting barbed wire and the district is guarded fiercely by armed Turkish guards around the clock. Absolutely NO PHOTOS are allowed as they're not skimpy with the aggressive signs. When the Turks invaded, unlike other cities, they wrapped this Greek Cypriot neighbourhood in barbed wire (including access by sea) but left the Turkish neighbourhoods "unwrapped" so to speak. Tens of thousands of people lost everything they owned and many became refugees in southern Cyprus. In 1984 the UN declared that the area must be given back to the rightful owners, but that didn't happen. Last night, the crown I was told three years ago by a dentist in Athens to replace finally fell off in my mouth while eating a Greek Salad. I sent an email to George (our Cypriot dentist) and he booked me for the next day. 380 euro. This afternoon, we replaced some of the teak deck plugs and re-siliconed inside the forward hatch under the anchor chains. I had silicone in my hair, on my face, legs, bottom of my feet, and all over my hands and arms. I rubbed a half bottle of fingernail polish remover over my body and there's still residue. The rain brought lots of sandy red Sahara Desert topside, so first opportunity we cleaned every nook and cranny, scrubbed around the windows, cleaned the screens, and even hauling out our carpets to wash. It was a good ol’ fashion spring cleaning. Our crew neighbours wash, scrub and shine every single day Sahara Desert or not. We stopped midday to sit in the square and watch the Sunday crowds. They get dressed up and stroll around the pretty marina promenade. We made the mistake of ordering TWO gyro platters, realizing we had enough food to feed the entire Limassol community. With three days until we lift Big Sky on the hard for our return to Canada, we’re managing our fridge and cupboard consumption, even counting oranges and lemons to get us to departure. Ever so gently, 32.2 tons was lifted and lowered into the water with repairs completed professionally. (Looks like Big Sky’s weight fully loaded is more than we originally thought.) The marina has been stellar in their follow up with repairs and ensuring we're okay with everything. Once Big Sky was floating again, we took her out for sea trial and all systems work fine. We sailed passed the oil and gas platform that had been towed passed our beach-front apartment yesterday and then planted about a kilometre from the beach. Nobody gets excited about that here. Returning Big Sky to her slip, we cycled back to the apartment to collect our things, and moved aboard, one week after returning from Canada. Enjoying a Greek iced coffee (frappe latte) in our cockpit with our Cypriot friend Marina, a rare monk seal entered the marina catching fish for lunch. See the video. He visited again a few days later when I didn’t have the camera, swimming right up to the cockpit to check us out. He’s adorable with enormous black eyes, eye lashes, and long whiskers. Monk seals generally swim solo and sadly they are critically endangered due to lack of habitat, they number only 300 in the Med, and 6 or 7 in Cyprus. They are the most endangered mammal in the Mediterranean. Marina insisted that I join her shopping (by car), a real treat from the back-packing bike rides we’ve been doing. First, we stopped at her cousin's house to pick lemons and another plum-like yellow fruit in season. Con and I are enjoying lemonade, hot lemon with honey drinks... no scurvy aboard Big Sky. 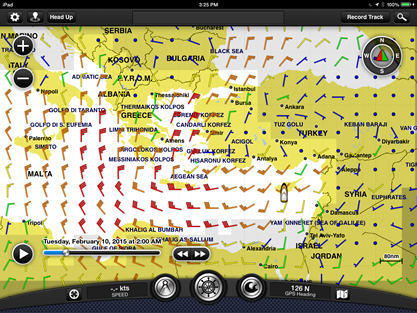 After seven months in Cyprus, weather dictated today would be our departure day. 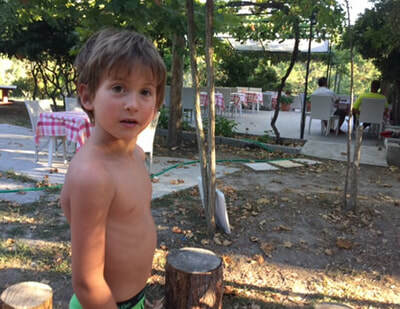 We had a 50+ hour journey to Kos, Greece and a nasty blow was expected as near Greece and leaving sooner than later meant we might bypass most of it and not be delayed picking up Albertine. At 11 am, we untied and gently bounced across the western side of the island waters before hitting the open sea; Turkey on our east, and the Greek islands to our north. 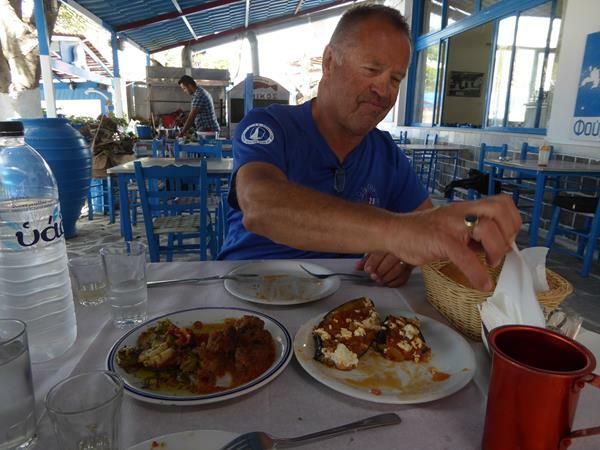 We motored the entire way, riding many currents running in our favour landing us in Kos, 331 NM in 45.48 hours, 5+ hours ahead of schedule. Once parallel with the Turkish coast, we were on high alert for refugees crossing to the Greek Islands. Con and I tag-teamed through the night, and about 2 am, I heard a faint transmission come through on the VHF. A man with a strong (maybe Turkish) accent called: "Can anyone hear my transmission? May Day, May Day, May Day." I woke Con and we immediately responded asking his location, what his crisis is, and how many people aboard. He gave his coordinates in a broken transmission which we believed was near Kas, Turkey, five hours behind us. He said, "I've lost my anchor and will crash on the rocks." We asked again, "How many aboard?" but didn’t hear from him again. Our thoughts immediately were that a boat full of refugees was in trouble. A male voice called us immediately on the VHF identifying himself as Olympia Radio (coast guard). With great relief, we relayed our information to him and didn’t hear the outcome. The reality of the refugees and their life-threatening plights has never been more personal – for us. The May Day call, and then learning of the 125 Syrians and lost lives (mentioned above) leaves us stricken with emotion. Thousands and thousands are fleeing some by motor boats, and many by less-than-adequate boats mostly from Turkey and Libya attempting to make it to Greece, Bulgaria, Italy, and Spain. 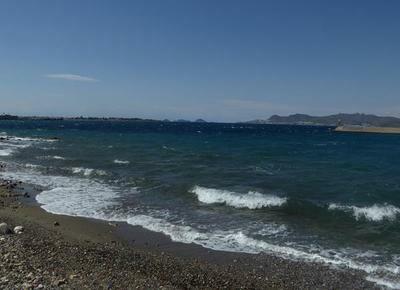 We walked the beach in Kos yesterday. 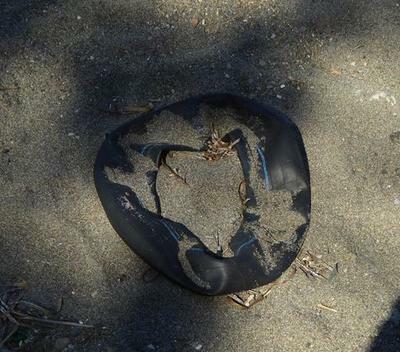 It was littered with discarded life jackets and flotation devises. In front of the castle (main tourist area) refugee clothes were draped over various pillars to dry. The human traffickers often don’t come to shore, but have the refugees jump and swim. Not everyone can swim. There are safe landing zones, but without proper charts and in the night, they don’t always arrive safely. The trafficking industry we read is an illegal billion-euro business and with no guarantees of survival. The refugee burden is putting tremendous strain on Greece already struggling to survive. One hundred refugees arrive every day in Kos. 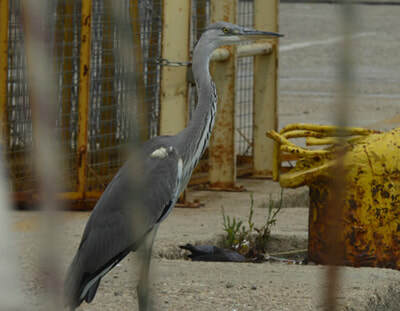 They gather near the police station (beside the castle) awaiting their fate. Everyone is being processed and moved further to Athens and then on to other countries, mostly Germany. Thousands are drowning in their desperate escape, and it’s hard for those processing the people to know who is coming as an economic migrants and who are desperate refugees. It seems there is no distinction at the processing place. Everyone is accepted! ​April 24 -- The wind continued to howl for the third day, keeping us tied safely in the Kos Marina. Above: a visitor on our way to Kos, Greece (Turkey in the background, and the landing area on Kos for refugees.) We cycled to the store and before leaving the pier, the wind pushed me into the hanging buoy and I toppled over my handle bars. My knee, thigh, and elbow are well aware of the accident. The bruises are in full colour today, but bleeding has stopped. This morning, Con and I cycled to the police station to witness the numbers of refugees waiting to be processed. Same as yesterday, about a hundred. 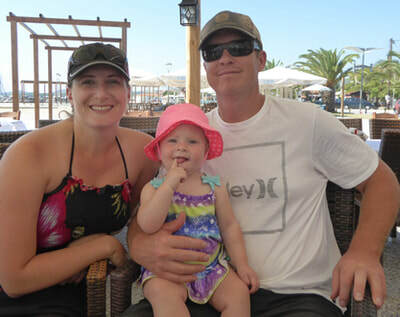 We asked a young couple in their 20s with a nine-month-old baby if we could interview them (not sure what we’d do with the information) however the interview left us with more questions than answers. They agreed to the interview provided no pictures would be taken as they feared exposure. They’re from Tigre, population in the millions, near Baghdad and were escaping the militant forces. She was referring to the 14-minute crossing from Bodrum to Kos. Their plight was a first-class holiday style, flying from their city to Istanbul, and a bus to Bodrum, and a pre-booked boat to Kos. She told us they were very comfortable, staying in a hotel near the castle awaiting processing. 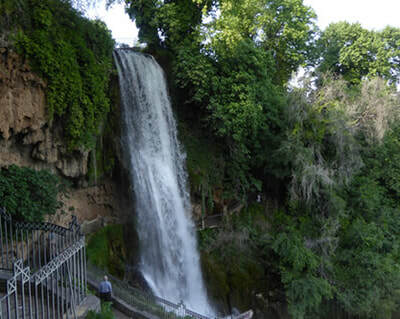 Their fear was, she said, “being caught by the Turkish coast guard and returned to Iraq." They saw other boats in the night, but those boats did not see them. 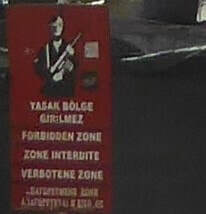 From our knowledge of the Turkish Coast Guards, they know EXACTLY where you are all the time. 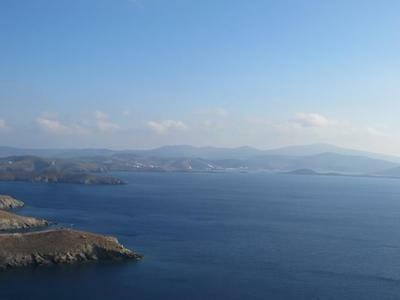 ​Bodrum across the water from Kos below. April 26 -- The wind put up a real ruckus, blowing with a vengeance causing the water to slap loudly at our stern and by morning, we saw the lovely gift it left, a thick layer of Sahara Desert everywhere. 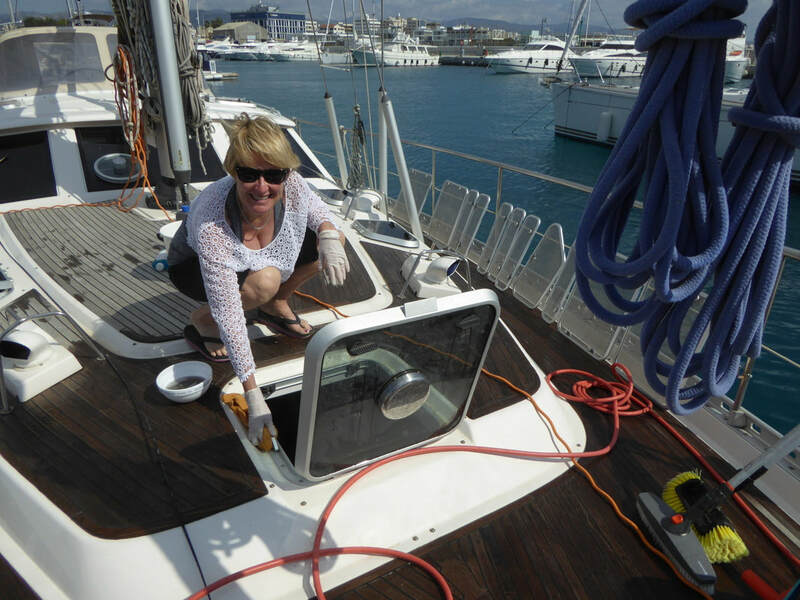 After a good scrubbing, we untied ourselves from the crisscrossed marina lines and set off for Leros on a beautiful beam reach with 17 - 20 knot winds on a flat sea. A jumbo-sized lone dolphin swam with us for a short while, coming close to the stern, turning sideways to take a good look at us. 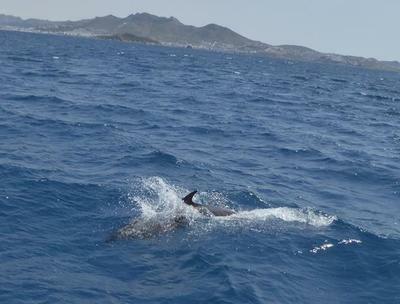 Behind the dolphin is the city of Bodrum, Turkey. 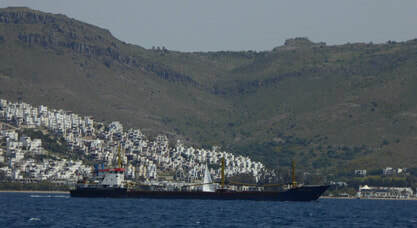 Four nautical miles separate the Turkish boat harbour Akyarlar from Kos. 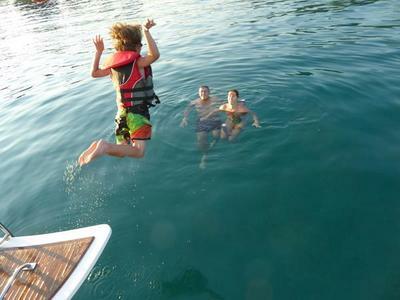 With a fast boat, you're in Greece in the blink of an eye. We ducked into a sweet cozy fishing town called Fournoi (pictured above) to hide from the Force 7 (30 - 40 knots) winds. Fournoi has the most active fishing fleet in the East Aegean, but most importantly for us, it’s tucked into a bay surrounded by tall hills keeping the winds away from the town. 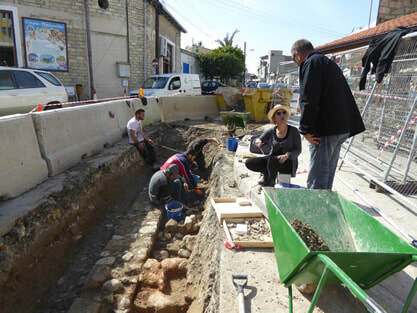 The main street is lined with mulberry trees and connects the quay to the town square where an ancient sarcophagus sits between two cafes. We'd first docked on the side where the ferry is docked (pictured above). About 5 am, we woke to people talking and looking in our windows. They were early for the 6 am ferry departure. The next day was one of those "perfect" sailing days. We woke to expected calm seas and slight winds and took our departure from quay after two days escaping the big winds. Almost immediately we set the sails and before we could say, "Well, look at that," our GPS told us we were flying at 7 and 7.5 knots. It was comfy and warm in the cockpit, so much so, I put on my bathing suit for the first time of the season and read in the semi shade of the cockpit. 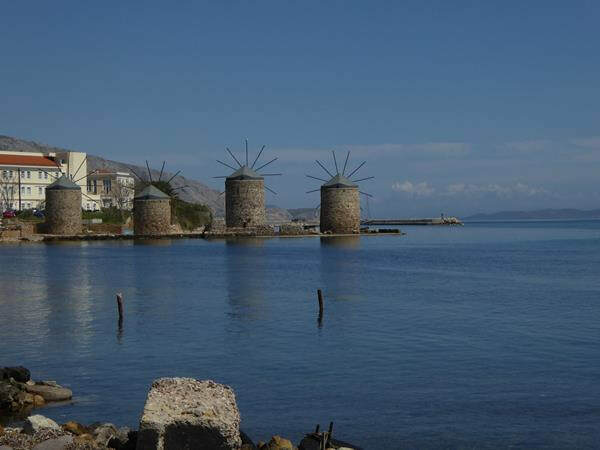 Eight hours later, we dropped "Bruce" and backed up to the quay in the busy town of Chios. Always reliable Bruce held on the first drop, but lassoing the yellow cleat ashore with our stern lines is always a challenge since our stern angle is too sleep to step off. Many people chose to watch, but nobody volunteered to catch a line. No problem, I lowered the gate, stepped ashore and did it myself. We strung up the passerelles (gang plank) a major undertaking. First balance the heavy thing from the boat to shore, attaching it to the halyard, tying it secure vertically, then attaching the handrails, and finally fixing a flue flat fender to the stern. Our 8-hour sail became a 10-hour event. Finally we settled and celebrated with a home-made ice-cold cappuccino frappe. Albertine arrived in Chios from the Netherlands, via a flight to Turkey and a ferry. We rented a car and have a list of places we want to visit. 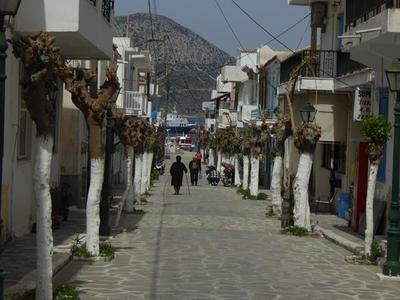 The Mastic village of Pyri with the unique finish on the buildings. They white wash them, then scrape off the paint leaving steaks. We visited the three Mastic villages in total. They’re built with strong fortification towers and houses to protect their gum product from pirates. The strong outer walls are similar to Arabic medinas where there are few windows on the outside and open on the inside. 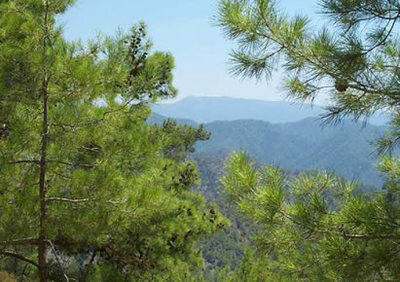 We visited the Nea Moni monetary hidden in the pine forest, dating back to the 11th century. 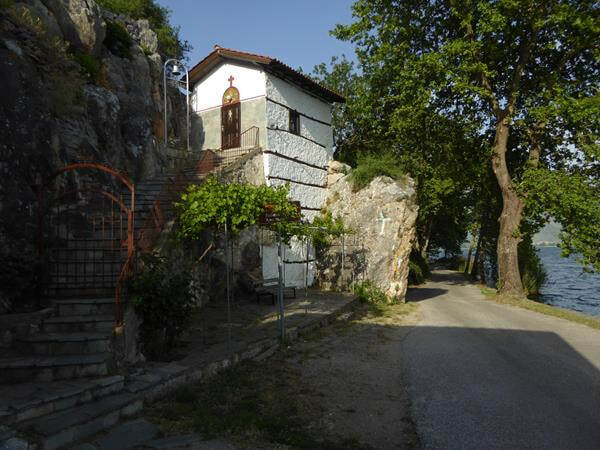 Following 250 years of Ottoman rule, the Chians joined the Independence uprising in Greece in 1822. 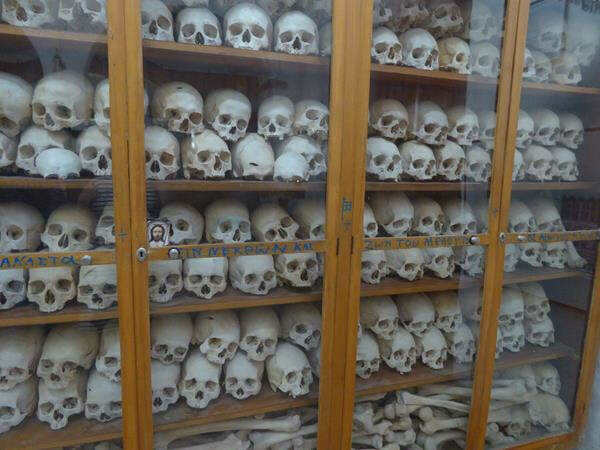 The Sultan was enraged and sent an expedition that massacred 30,000 Chians, enslaved twice that number and then destroyed the monasteries and houses. The island of Chios has 20 settlements in the south known for their medieval product, "Mastic Production" from the Mastic bush. It secretes a resin or gum that before oil and gas was the product used for paint, cosmetics and medicine. Today, it's used for gum, liqueur and toothpaste. They harvest the bark by separating crystals that become the marketed product. 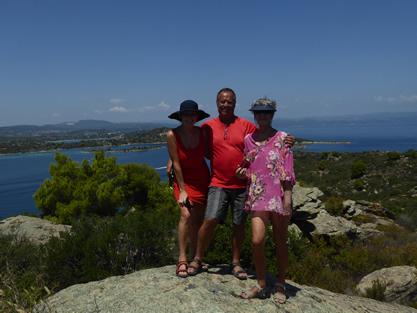 May 4 – The three of us motored to the lovely island of Lesvos, (above) passing dolphins along the way. Our cost for the night, including good drinking water Con calls, "Angel pee", electricity, and WiFi: 5.80 euro. We moved three times in Sigri (Lesvos) before settling. The first attempt was too full with fishing boats, then we tried along a concrete wall, and once secured, the coast guard came to our window, "You must leave, the navy ship is coming". Finally, we relocated at anchor in what was likely the best spot of all. May 8 -- Few cruisers travel to "The Fingers" preferring the turquoise waters, but there's lots to be said about the north. 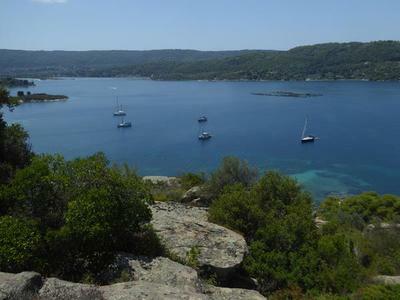 Fabulous anchorages, grand scenery, green dense pine forests, mountains, and fine sandy beaches. 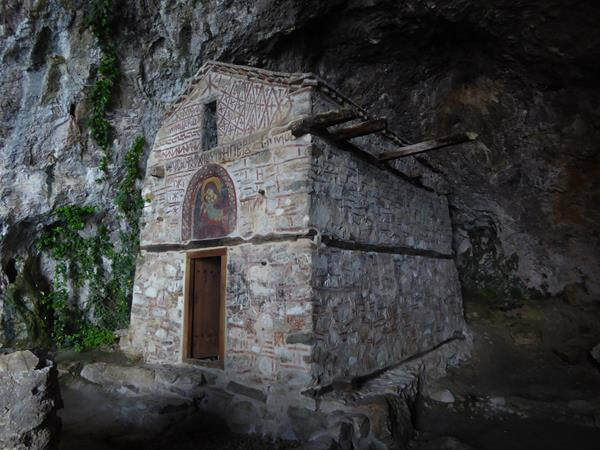 It's more Balkan than Mediterranean, situated under Macedonia. 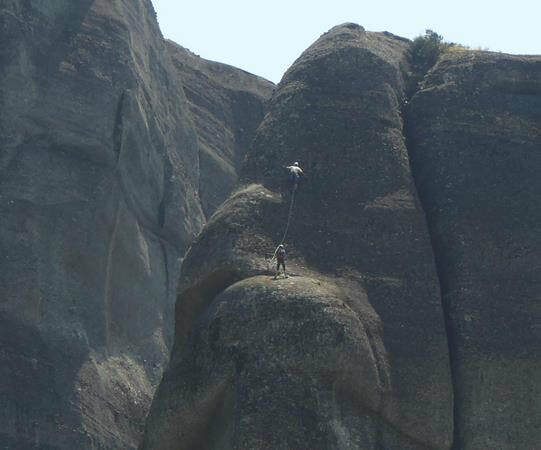 The first finger, Mt. 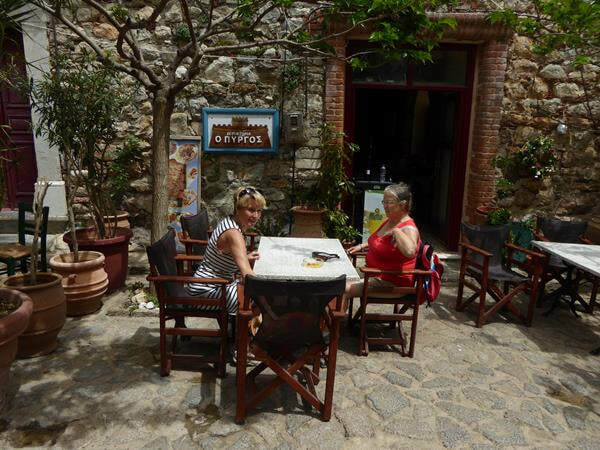 Athos, is populated by 2,000 monks, ABSOLUTELY NO FEMALES ALLOWED, INCLUDING FEMALE ANIMALS -- CHICKENS ARE ACCEPTABLE.... The forested "finger" is populated by jackals, wild cats, boar, deer, wolves, monks, and marshes. It's a birder's paradise. Mt. 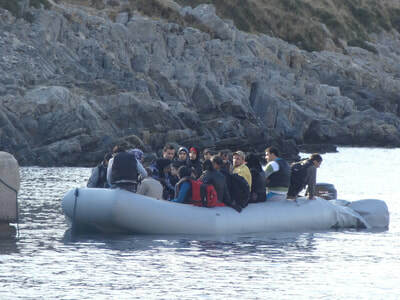 Athos is the eastern finger and by law we must stay 500 meters from shore, God forbid they cast their eyes on women. 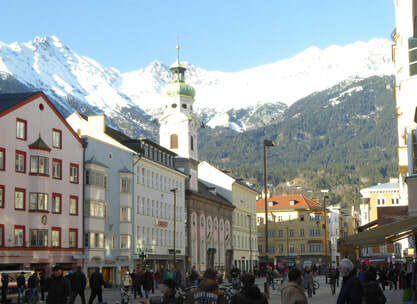 Houses and palaces where they live are scattered up and down the mountain. In 1060, the emperor forbid access to the holy mountain to females more evolved than a chicken. 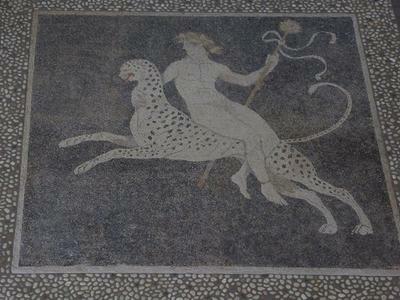 An exception was made for female cats though to keep the rodent population down. Since Greece is part of Schengen (which abolishes border controls) many women have tried to gate crash, and all attempts have failed even when taken to court. We spent the night in a small harbour in the intersection of the east finger and the middle finger. Continuing along the middle finger, we enjoyed the beautiful lush green vegetation and beautiful seas, except at the "fingernails" the sea becomes somewhat agitated. 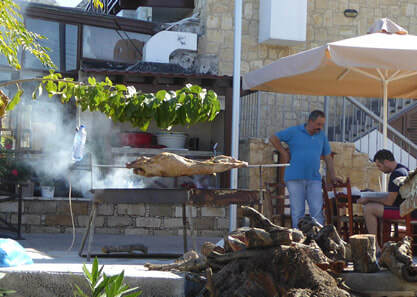 In Port Koufo, we celebrated Nick's birthday (our daughter) and Mother's Day at a wonderful fish restaurant. We selected a bass and Red Snapper, both delicious! Along with a few well-prepared appetizers. 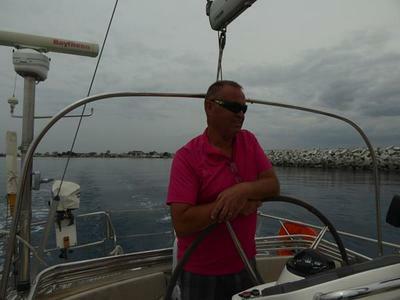 We motored down the first finger, around the rolling sea at the fingernail to Sani Marina. It was 80 euro a night and came with four t-shirts, and a couple of interesting magazines. 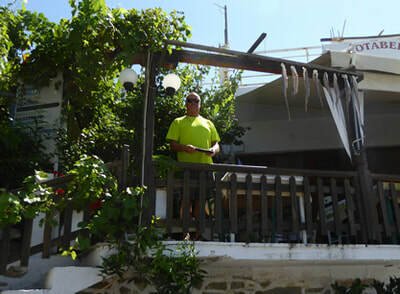 We’re not complaining, since in the last week, we’ve paid about 4 euro in moorings. May 17 – In a rental, we drove to Meteora (between Kastraki and Kalabaka) where the forest valley rises vertically becoming enormous stones, reaching 300 meters and at the top, monks as early as the 11th century began building monasteries, perching them on those skinny structures right to the rock's edge. We climbed to the top of the largest one, 300 steps. 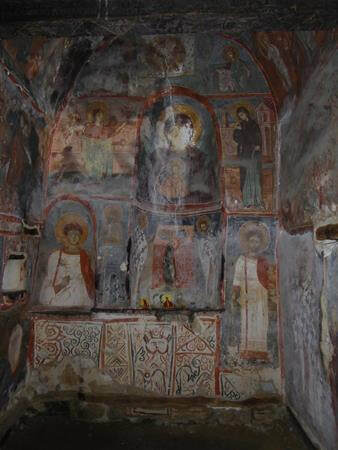 There are six working monasteries remaining. The idea of living on the top of such a precipitous is beyond my comprehension, but climbing the rocks for sport, well, I don't even have words. You can barely see the climbers below in the photos (one is the close up shot). 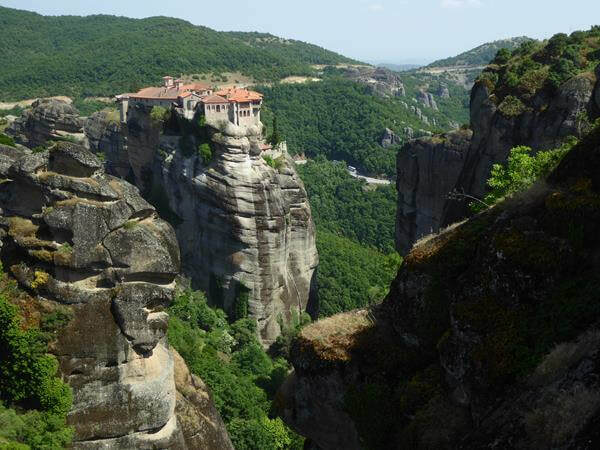 The monastery was used in the James Bond movie: For Your Eyes Only. rive on the wild side! May 18 – The road trip took us deep into the Pindos Mountains where the roads hung onto the hillsides by a prayer, and in fact, we could have used a monk or priest for a prayer or two where the road simply disappeared. We realize now why we seemed to be the only car on the road for hours / kilometers. The photo below was taken from the other side of the curve. We were travelling about 60 KPH when Con swerved wildly into the oncoming lane to avoid falling down a washed away/or swept away piece of the road. The rope-like thing is the side rail, and the triangle in the water is our side of the road! Further along is another part of the highway now in the river. The mountain is a sandy unstable structure. The line in the photo is actually the road, only the on-coming side of the road remains, the rest is in the ravine. We didn't know it until Con spotted the orange cone ON THE SPOT AFTER THE ROAD PIECE THAT'S MISSING. All day, we encountered sunken pieces of road and boulders hanging over the roadside just waiting for a sneeze. Many washed away / swept away parts along the highway. Nevertheless, it was beautiful! Albania was just over the mountain and having travelled there a few years ago by car, this road conditions were very similar to the experiences we had driving there. We detoured to investigate an ancient stone bridge over the Aoos River which took our breath away with its simple pristine beauty. (That's me on top.) We circled around the bridge to the town of Konitsa, parking in front of a coffee shop for a Freddo Cappuccino. We had just taken a seat when two officers appeared looking for the owner of the "rental" car. 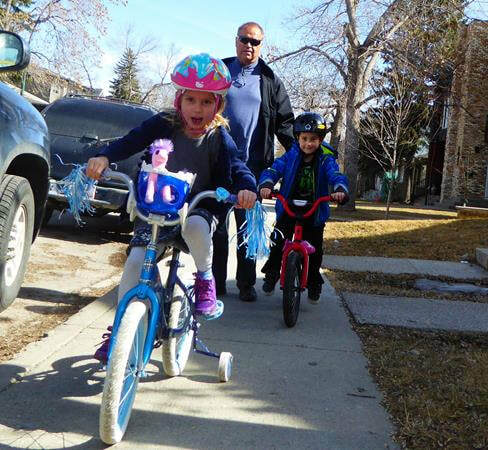 They pulled out their ticket book, scanned the area and then spotted us, smiled, and in sign language asked us to, "Park down the hill and enjoy the town." We thanked them and moved the car. Surviving some of the scariest roads, we broke out of the forest, rounded a bend and our eyes took in one of the most picturesque mountain towns in Greece called Kastoria. It's situated on a peninsula. 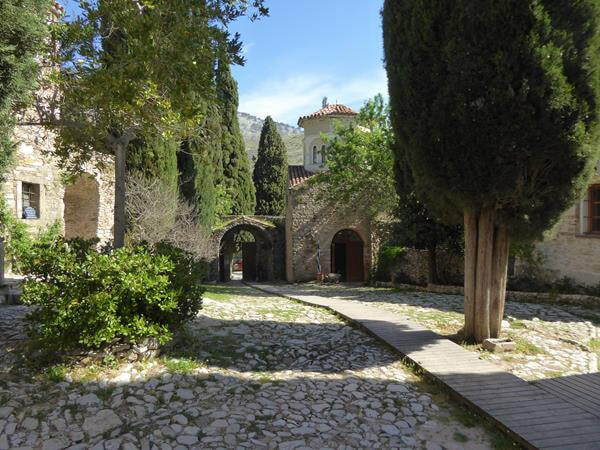 We left our hotel and walked to the opposite side of the peninsula, passing about 10 of the 54 Byzantine medieval churches! Following the water's edge around the bulbous point, not realizing until we finally reached the other side again, that it was a 7.5 kilometer hike! It does leave us wondering by what criteria they base their statsistics. Con will now take hormone pills every day of his life. We taking advantage of our time home delightfully exhausting ourselves at play with the grand kids. 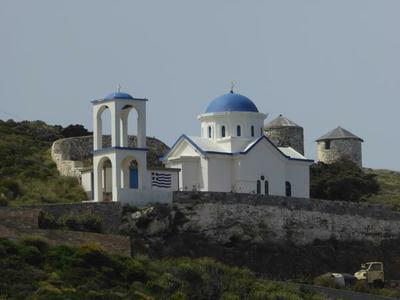 June 27 – History is unfolding around us in Greece. Last night, the newly elected Prime Minister announced Greece will not make the payment on June 30th and instead will take it to a referendum in 10 days. (It's like putting the default decision on the backs of the Greek people.) The moment the broadcast was finished, the lineup began at the instant tellers. Today, we cued in a long line for cash. Many machines were already empty. Billions of dollars are being sucked out of the machines in preparation of the default. We checked out of the marina in Thessaloniki this afternoon and payment was to be in cash! We'll anchor at the bottom of the middle finger tomorrow and enjoy the summer as chaos erupts. Despite Greece's tribulations, yesterday, walking through the lovely shopping area of Thessaloniki, Kalamaria, we bought bread and other little things that came to 2.70 euro the proprietor GAVE us two ice cream cones. That is the Greek way. I found a great place to have my hair cut and highlights, it’s half the cost for the same in Canada. 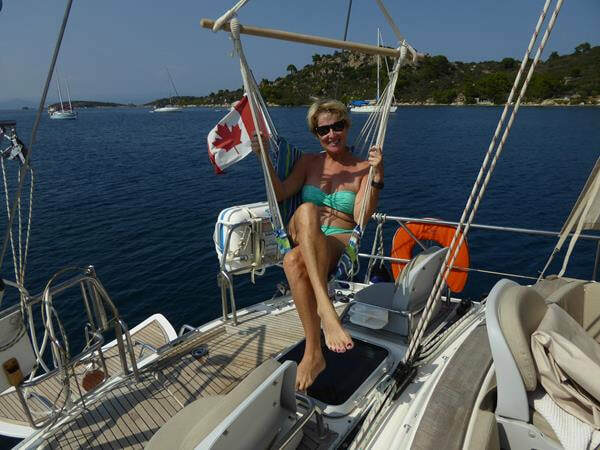 June 30 – We lifted the anchor at the same time three storm cells surrounded us with thunder and lightning bolts and a gentle 11-knot-beam breeze that carried us at 6 knots to Neo Marmaras. We tied easily at the "pirate ship's" spot, but were told we’d have to move to the Glass Bottom boat's spot once he departs because another Pirate ship would be arriving, and when the pirate left in the morning, we’d have to move back for the Glass Bottom boat. For the next few days, we played Musical Boats, moving seven times. 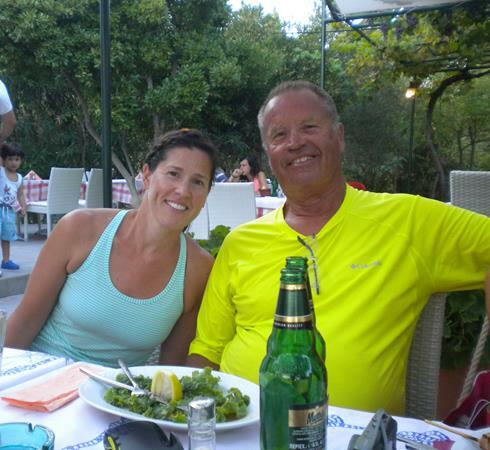 The Greek captains (ferry boats, tour boats, pirate ships and glass bottom boat) made us feel extremely welcome. Coincidentally, we saw the boat of an old acquaintance docked right behind us. Jose, whom we met in Ceuta, Africa. It now had new owners. Again, we lined up for cash at the ATM, and the country sits on the edge of the bankruptcy precipice. The town grew on us and we stayed two days. A stage was nearly completed, two meters from our bow or 100 meters (depending where we were docked). 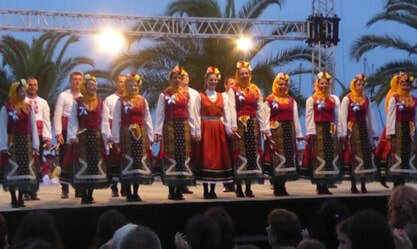 The multi-cultural concert would begin at 8 pm. At 7 pm the crowds began to gather and hundreds of tourists, mostly eastern European (Bulgarians, Serbians, Macedonians, Russians) passed the time by peering into our windows and taking pictures of themselves with Big Sky and our Canadian flag in the background. We had great chairs for the show and at one point, I glanced down the pier to check Big Sky and saw an eager tourist on our bow doing various poses as her companion took photos. She’d stepped up over our rail in her high heels. I walked closer and reached her as she was checking out her photos. I peered over her shoulder and despite wanting to say something, the photos were good. A big market was underway the morning we were leaving, so we filled the boat with fresh fruits and a beautiful basil plant for 2.50 euro. 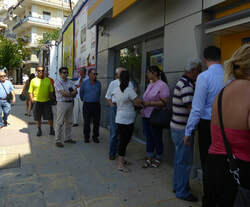 July 6 -- Most ATMs were empty and those dispensing euros had long lines. 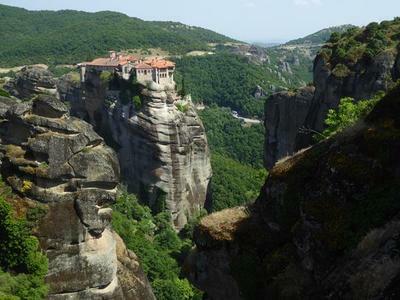 Greeks are now limited to withdrawing 60 euros per day (tourists more). The YES/NO vote has been a long soap opera featuring the new Greek PM against the EU, IMF, and loaning countries as Greece defaulted on their loan. The offer given the Greek PM was rejected and he called for a Greek vote. They voted, “No.” The PM is going to Brussels to begin new negotiations, minus the finance minister who resigned today. Actually he was asked by EU members not to be involved. 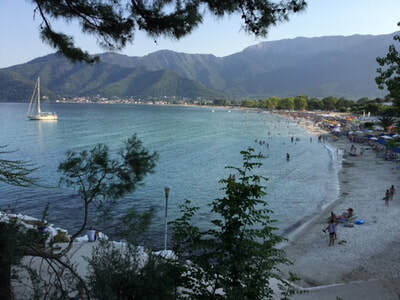 He had called them terrorists last week.At anchor in the quiet harbour of Kaliva on the island of Thasos, three excavators have just stopped working and sit on the marble breakwater wall, we believe because there is no more money to pay them. The island of Thasos is rich in mineral deposits, specifically marble. 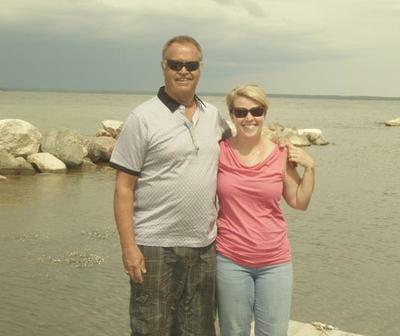 We circled the island in Big Sky, enjoying the beaches and small towns. 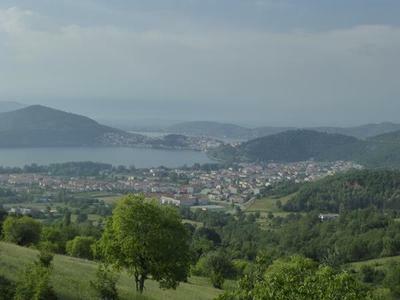 The area is populated by eastern Europeans on vacation: Bulgarians, Romanians, Serbians, Albanians, and Czechs. July 8 -- Remembering Larry Radu's passing, 14 years ago today. A beautiful soul, taken too soon. July 9 -- Money is running out in Greece, not just empty ATMs but at the grocery store there was an awkward inability to make proper change with coin shortages. Speaking with a man in his 40s the other day, he expressed his relief that the Greek's voted NO believing his government would go back to Brussels with more leverage. Speaking with family in Holland, they are tired of their taxes increasing, their pension age going up, in part to keep Greece afloat. The Greek man said, "I am a good Greek. I work two jobs and pay my taxes which is 60 percent of my salary. I don't steal, cheat or rob people, Greek people don't do that. When I see people in need, like two hitchhikers from another country with no food, I pick them up, take them home, feed them what my family eats, house them, and send them on their way. 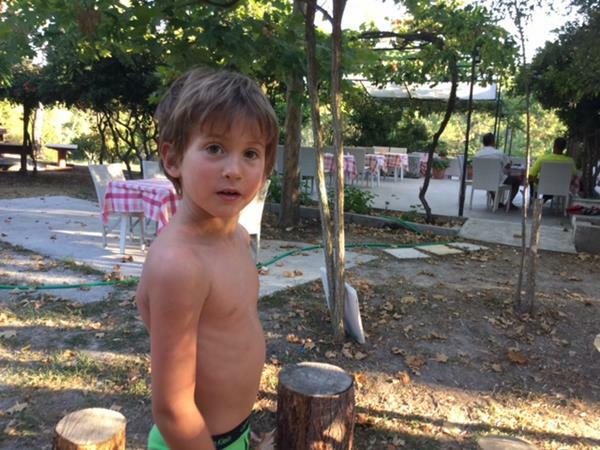 We are simple living people and want a good life for our kids and for the Greek people." We joined a French couple, perhaps the only other tourists in town, for drinks aboard their sailboat. Today, the Greek people wait patiently for their PM's and the EU's next move. The people voted “No” and now the PM has done the complete opposite and is offering more concessions. The EU will give their approval or rejection today and Greece will be expected to make another payment July 20th. 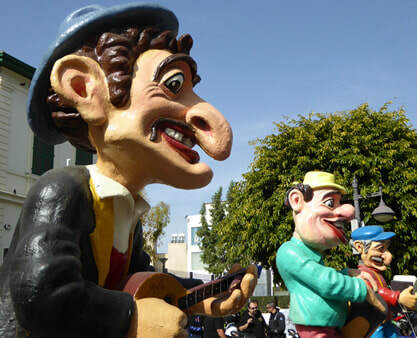 In their current proposal, they're asking for 53 billion additional euro, much of which will become their next payment. The sea is calm, winds slight, temps in the 30s, water nearly the same. 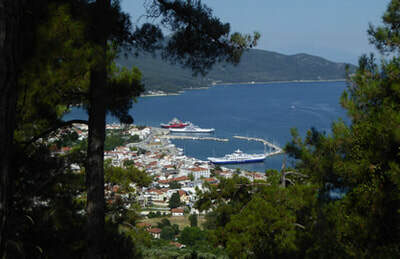 Next stop: town of Thasos on the island of Thasos. 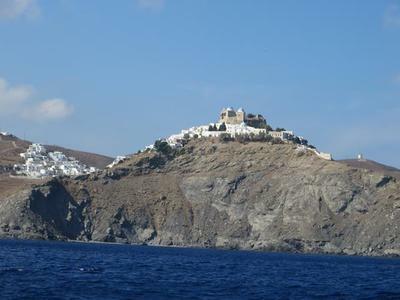 This island was thriving in the Roman times with a strong seafaring empire, around 400 BC. Since then it's survived on its mineral deposits of delicate white marble. Quarries scar the countryside here and there, but as for the rest, it's covered in the healthiest pine forests you can imagine. 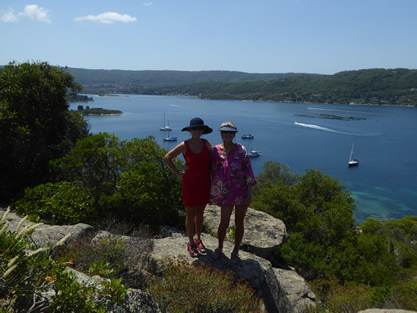 We climbed the hillside to the Roman ruins for a bird's eye view of the harbor. 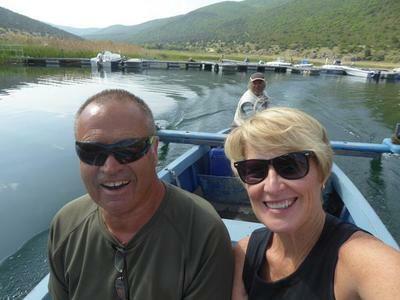 After a few nights at anchor we needed to charge up our boat batteries and set off for Kavala in the Macedonian province of Northern Greece, the second largest city in Macedonia, (Thessaloniki is the largest). We stocked up at the store with non-perishables in the event Greece implodes. 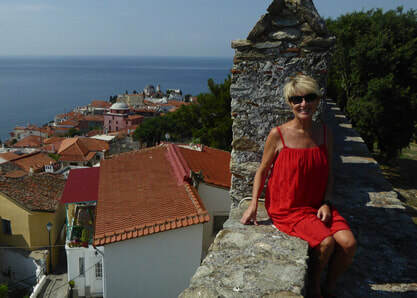 Later, we hiked up to the top of the Kavala Castle. We left the island of Thasos, believing we had good weather to cross the North Aegean. 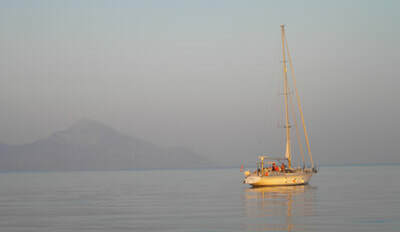 The sea was calm, despite a nasty meltimi blowing south of us and on down the Aegean. Three hours into our 10+ hour trek the waves were building to two and three meters and coming at us forward and port side. I'd battened down the hatches and secured anything (I thought) could fall. One big ugly wave hit us with a bang, and our vacuum cleaner fell from the top bunk, and various items came down with one hard crash. Lemons were rolling back and forth. A tall basket snug in the fridge had flipped upside down! Lemons were everywhere. Kettle water was awash over the kitchen counter. As we neared Mt. Athos, we had 45 knots pushing us (sails down) from the stern which we believed was partially from the wind rushing down the mountain and partially from the meltimi. 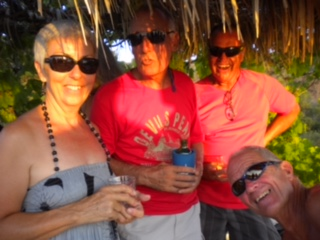 Mid-afternoon, we reached paradise, dropped anchor near our friends Judy and Bruno aboard Pacific Pearl (white sailboat pictured above) and enjoyed a cold glass of wine and snacks together. Behind them is the catamaran Nimrod and behind us (not pictured) is Ron Glas. 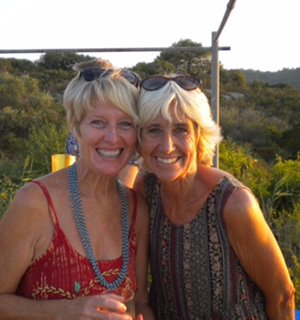 We all wintered together in Marina di Ragusa three winters ago. The mayor of Thessaloniki’s summer house is directly in front of us. Properties are not cheap here. A small place just up the hill and to the left in this picture was just bought for 450,000 euro. 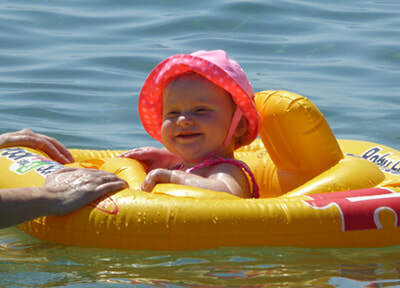 With the air temperature the same as the water, we play all day in the water. 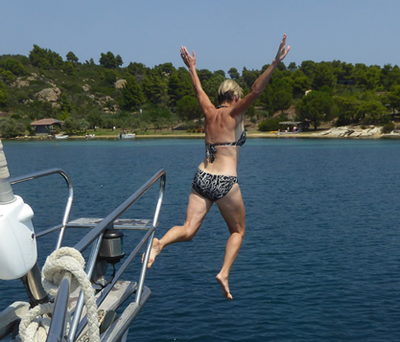 That was my first leap from the bow spit, about the height of a high dive. Judy, Con and I took our dingy to shore and hiked to the top of the cliff for panorama shots of the beautiful area. We had a catastrophic failure aboard Big Sky when our Victron charger/inverter petered out. 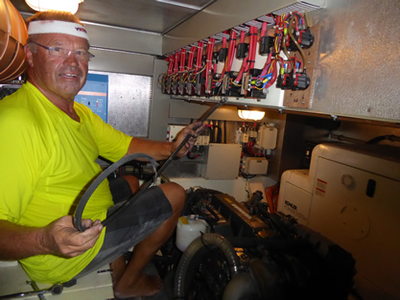 When at anchor, we need batteries for minor electrical needs (lights, charging the laptop) and the generator for everything else, including charging the boat's batteries. It might have died in the 40+C heat in the engine room, or because it’s seven years old. 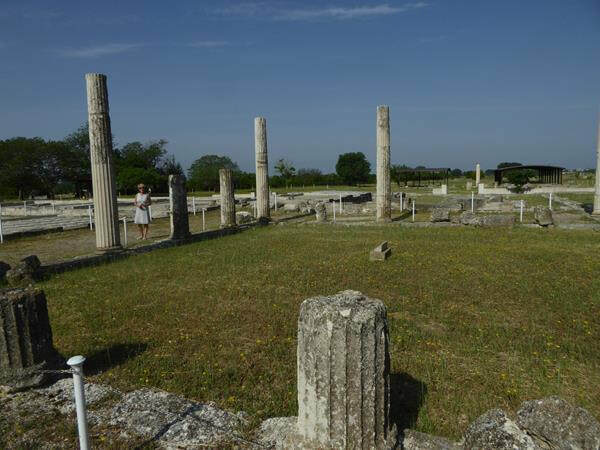 Immediately, Con began calling every Victron dealer in Greece and not one unit could be located. They wouldn’t order one either because it was impossible for us them to may payment in advance because of their banking crisis. Con located a dealer in Istanbul, purchased it online, and booked a flight there and back out of Thessaloniki for first thing in the morning. Judy, Con and I left before sunrise by dingy to the mainland. In a rental I drove the 1.5 hour trek to the Thessaloniki airport, promising to collect him at 8 pm. Judy and I shopped the entire day, having an absolute blast, filling the small car to the brim with items, and then went to the airport. Upon arrival in Istanbul, Con purchased a CND$70 Visa, taxied to the shop, collected the unit, taxied to the airport, and waited for the 6:30 pm return flight. At arrivals, we spotted Con walking with the heavy bundle toward the exit door and then we spotted a very stern Greek Customs Agent stop him. Two hours later, Con came through the doors with two options: 1. Leave the unit until Monday so they could make an official ruling, or 2. pay an obscene amount of euros on the spot. Con refused both and the agent wouldn’t budge. Another much friendlier agent arrived. She asked Con if he'd pay half the amount. He agreed. 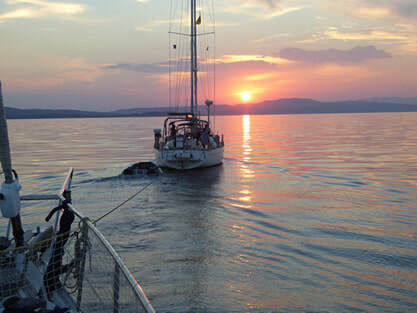 Midnight, we parked the rental and the four of us, loaded the hard-bottomed dingy with all our heavy bags and the heavier Victron and shot across the water, guided by the full moon to our anchorage. Bruno, a French chef prepared a delicious meal for us and we finally relaxed taking in the warm evening air under the moon and stars. It was a fabulous way to end a stress-filled day. Three hours later, at 5 am, Con slipped out of bed to begin installing the unit. Everything was going well until the last stubborn screw. It was stripped. Our wonderful anchorage is populated by friends we've known over the years, and as they began to rise, Con rowed to them to borrow various pieces of equipment. Five sweaty chaotic hours later, we were basking in air conditioning with a load of laundry turning in our machine on a temporary hook up. 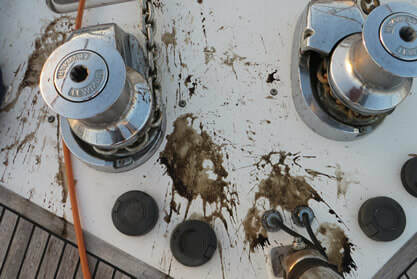 The next morning, Con removed the offending screw with brute force and an hour later, we were well submerged in the 29-degree sea water with the new Victron mounted on the engine-room wall. To quote Bob Dylan: "Chaos is a friend of mine." Locals John and Niki (blonde pictured with me above) warned that a storm will arrive early evening. We all prepared, taking down our tarps, letting our more anchor, and waiting. It came! First lightning appeared in the south, then in the southeast, and then in the north. Pictured is a lightning bolt behind Judy and Bruno’s Pacific Pearl. All three systems circled us and at one point we clocked 49 knot wind gusts on our meter. Rain came down in sheets washing the boat and it was over within the hour. First thing in the morning, we left for Koufo, dropped our Bruce anchor deep in the pretty harbour, rowed in for lunch, and ready to leave, we tried to lift the anchor without success. We pulled in 30 meters, but the remaining 20 wouldn’t budge. Wind picked up and dragged Big Sky across the bay nearly sideswiping a small sailboat. I drove Big Sky back across the bay, dragging the anchor and whatever else it was hooked on. Con kept telling me to drive up onto the sandy part of the shallow beach. 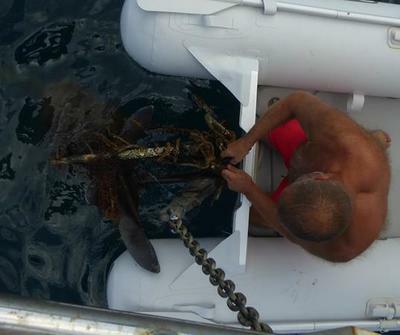 He was trying to get the anchor in more shallow water. People moved their towels from the beach and gestured for us to drive up onto the beach. With that fail, Con took the wheel and dragged the mess toward the fishing boats at anchor. I tried to lift using the buttons up and down. It began to cooperate and this surfaced. 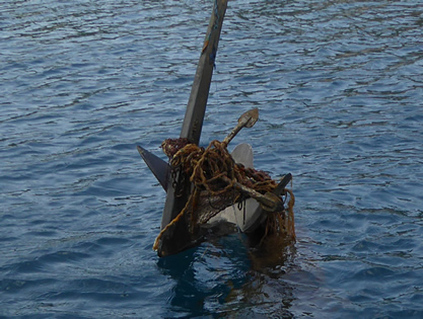 The anchor was hooked on a chain or long rope or both and wrapped in netting. Con jumped into the dingy, cut off the netting. I dropped a rope attached to our cleat, Con strung it under the mess, and I attached the other end of the rope onto the cleat, lowered Bruce and it was free. Unfortunately, the mess is now back in the bay awaiting the next innocent victim. Be warned. Nick, Bryant and Dex Arrive! August 11 -- It was touch and go whether we'd have the car to collect daughter Nick, fiancé Bryant, and nearly 7-year-old Dex from the airport, one hour away from Nikiti, where we’re docked. The car rental representative said (via Skype), "Yes! You do NOT have a confirmation; NO! it IS available." We showed up at 9 am and once the rep (using his mouth) siphoned out the remaining gas (cars are rented with enough fumes to get you to a service station) we were off. Dex ran to us hugging, smiling, and talking, filling us with his joy. As soon as we entered Big Sky, and Dex checked out his goodies in the top bunk, we set off to the beach. We sailed to Neos Marmara, the pretty town where we played Musical Boats with the Glass Bottom boat and the pirate boats. 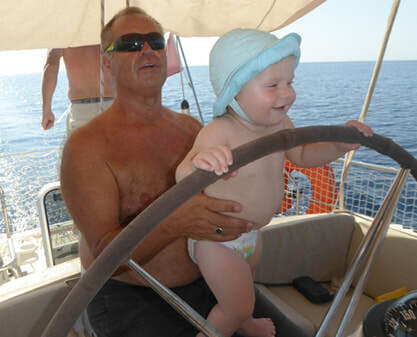 Our Pirate Captain friend greeted us warmly asking, “Where are you sailing next, Crete?" "Nikiti!" he shouted and scratched his head looking over our boat. "Why would you go to Nikiti?" Later that afternoon Con checked our engine which has been responding sluggishly. "Turn on the engine," he shouted to me from his seat in the engine room. Once I did, sea water spewed out at him through a crack in the hose. The heat is a difficult nemesis for Big Sky. Unfortunately, the engine was still not quite right. We'll hire a diver to clean the prop at some point. The Monk Police Got Us! 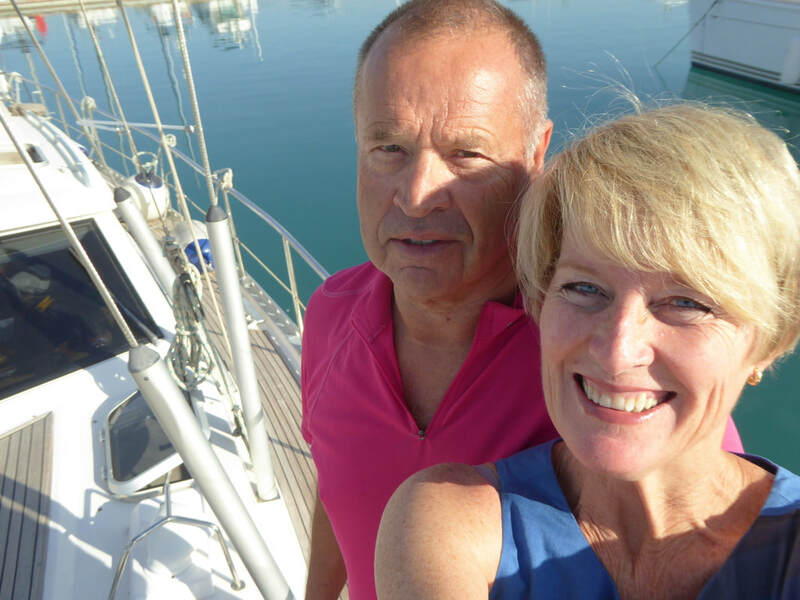 Judy and Bruno managed a magnificent tow which lasted a few hours, averaging 3 knots gently and safely towing us through the Archipelago. The tow began at sundown and the anchoring was done in complete darkness. Bruno’s excellent skills placed us perfectly over a safe area, we dropped Bruce, we untied from our bow and reattached us at our stern to pull us backward to set the anchor. It was a perfect manoeuvre. 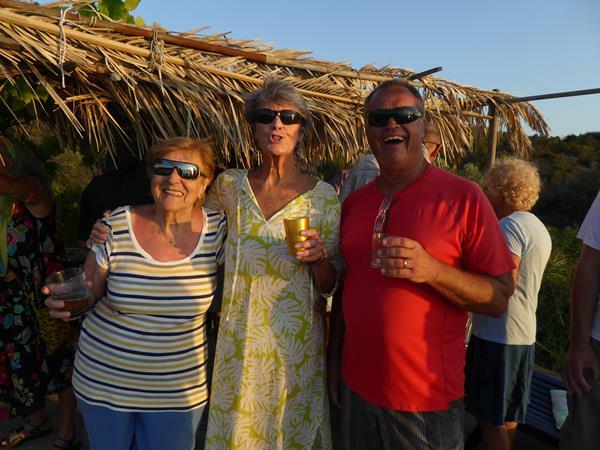 As a thank you, we invited all the people in our cozy anchorage (Judy, Bruno, Sally, Tony, Simon, Lorna and the five of us) to help us celebrate our 11th anniversary in a restaurant across the water. One of the email’s I’d sent requesting a mechanic was responded to by Gerry. He arrived a few days later since there had been a Greek long weekend. Con collected him and his heavy tools in his dingy and returned to Big Sky. The program turned out to be the fuel pump. Gerry extracted it and sent it to a repair shop in Thessaloniki with a promise to return in a few days. Components were air freighted from Germany to rebuild it. We were in a precarious situation aboard, down to our last tank of water leaving us about 600 litres. Our trusty generator runs three times a day for about an hour each time to keep our batteries charged so we can have refrigeration, lights, and to flush the toilets. But, we were literally “anchored”, unable to go anywhere without our fuel pump. Big winds arrived that night blowing 30 knots. "Bruce" our 50 kilogram anchor kept us pinned to the spot where Bruno and Judy (Pacific Pearl) towed us. They promised us they will remain at anchor with us until our engine starts again. It’s humbling to have such good friends. From where we're anchored, as the crow flies, it's 5 kilometers to the other side of the island to the town or Nikiti, where in a perfect world, we will be with Big Sky by Monday to collect our next visitors, daughter Lindsey, hubby Les, and sweet nearly one-year-old Kate who will arrive Tuesday. That means we must depart here by at least Saturday, catching a bit of the meltimi winds to take us 50 NM around the finger. Cooler winds have arrived, bringing down the air temperature a bit, making sleep aboard Big Sky at night much more comfortable. August 23 --Following eight days at anchor, our engine is back up and running. Gerry, the fantastic mechanic couldn't have been more attentive to our needs, responding as soon as I contacted him and driving from a distance on the mainland to get to us. Gerry babysat the entire process for us, and the moment it was in his hands, he made the long trip back to our boat to complete the work. By 1:30 pm yesterday, we heard the familiar purrr of the engine. We were back in business. 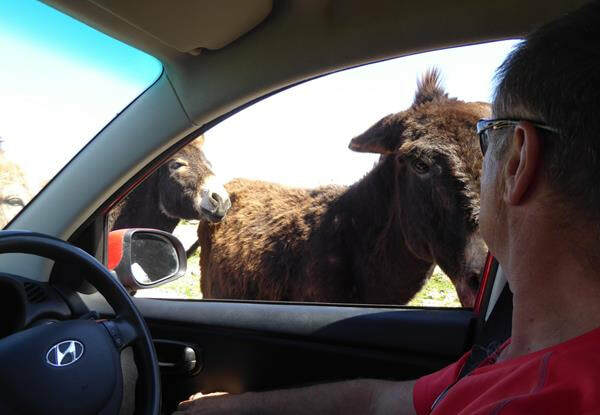 On our test drive, Bruno and Judy set off their horn. We left at the crack of dawn for Nikiti (50 NM around the finger) the nearly the opposite point from where we've been anchored, just 5 NM by car. 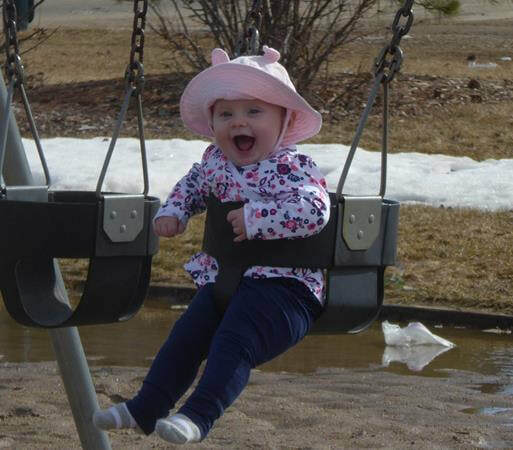 Here, we will position ourselves to collect daughter Lindsey, hubby Les, and sweet one-year-old baby Kate on Tuesday. 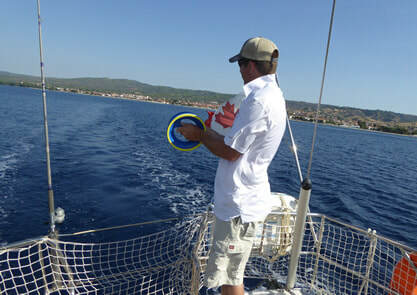 August 27 -- Our sail to Nikiti was rough, especially rounding the Halkidiki finger. 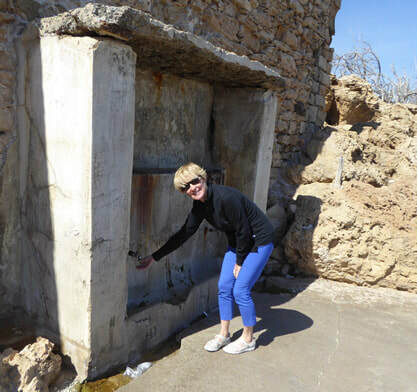 We filled up the water tanks, and recharged the batteries there. It’s a pretty tourist town. The harbour master speaks as much English as we do Greek, but we communicate just fine. We're familiar visitors at this point having been there a few times. With our rental, we collected the trio from the airport. It had been just a few months since we last saw Kate, now 11 months old and she’s expressing a full personality, lots of words, and walking. She know us from our daily video chats on Facetime and spotted us at the airport with an enormous smile. The first few days, were beach days. By the second day, Kate had a long deep sleep under the beach umbrella and I saw the envy on jet-lagged Lindsey and Les' faces. With shore power we had access to air conditioning aboard, and turned it on. It promptly quit! They say bad things come in threes. 1. Victron Inverter quit. 2. Fuel pump quit. 3. Air Conditioning. I told Con to let that one go for now, and we'll investigate it while wintering in Cyprus. 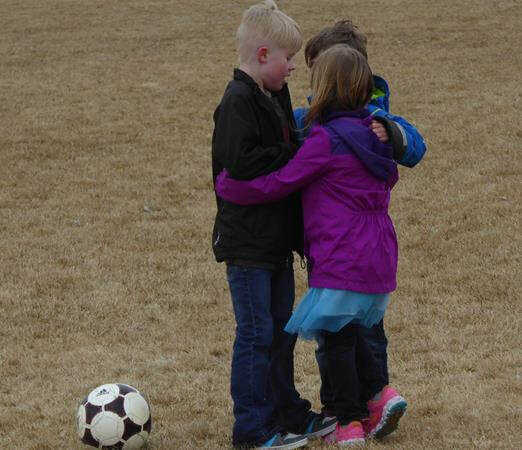 We learned that week that “bad things” actually come in fours. September 3 – Well, are the monks really cursing us for coming into the international “no-go” zone. 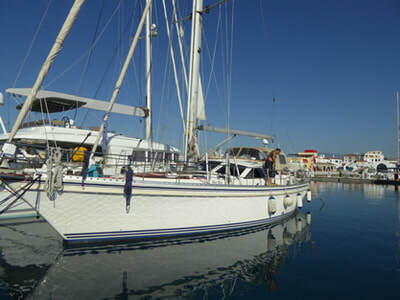 We left the Nikiti marina after a few days under a beautiful sail. Our destinations included a couple of anchorages on the east side of the middle finger including a stop in Neo Marmaras. The weather seemed just right for a visit to Mt. Athos to view the monasteries. 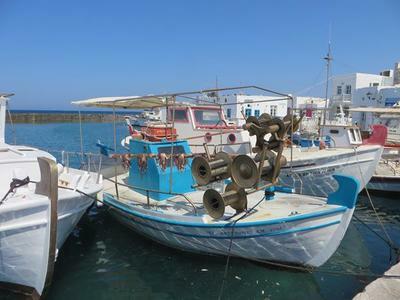 Our last visit resulted in the Greek Police telling us to turn off the boat, receiving a stern reprimand, the boat not starting, and a tow from Pacific Pearl. With Lindsey, Les and Kate, the sea became relentlessly miserable so we temporarily aborted the plan turning back to the centre finger to tuck into a rolly anchorage. When Les and Lindsey started turning green from sea sickness we aborted that plan and sailed further back to Diaporos, a consistently beautiful spot: deliciously warm calm waters, golden beach, and access to provisions just a dingy ride away. A few days later, we tried to get to Mt. Athos again. Les set out the lures (for a big tuna catch) as we crossed to the water to the island of Ammouliani tying onto the pier. He did have one bite, but it got away. Unfortunately, there was a disco that lasted til 3 am, so our morning departure was welcome. About half way through our tour of monasteries, the engine alarm set off a high pitched alarm. Les and Con tucked into the engine room, Lindsey, Kate and I stayed topside steering the boat (no engine) away from the coast. Con had two extra belts, specifically purchased for our engine, but incredibly they were too small! After some digging, Con found an old belt he'd tucked away a number of years ago, put it on, and we had engine power again. With the lures back out for the big tuna, Con went below for a sleep and the sea decided to come on strong with one and two meter waves, rocking us wildly side to side. Trying to hold Kate was the most difficult part of the whole day, as she wanted to play. We filled the bathtub, put it in the centre of the cockpit and sat her in it while the sea attempted to empty it with the rocking. Lindsey said, "Don't worry mom, I can endure anything for a period of time. I know it will end." It did, when we rounded the tip of the centre finger. Eventually, we motored into Nikiti and spent the rest of the day at the beach playing in the waves. We've gone full circle. 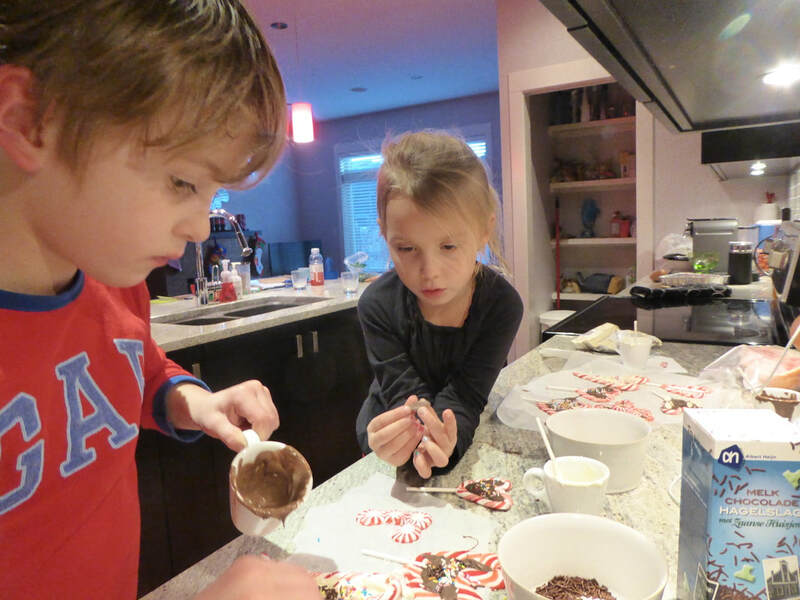 Tomorrow, we drive them to their hotel to await their flight home the next morning. Sailing around the tip of Halikidiki (second finger) up the west side tucking into Nikiti making it a long day for everybody. Kate was fantastic! 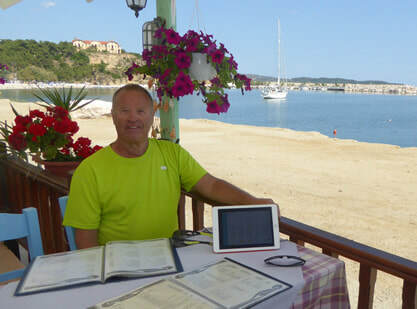 The friendly Nikiti harbour master assured us last week that if we returned there would be a spot for us. We motored into the marina seeing it was completely full. 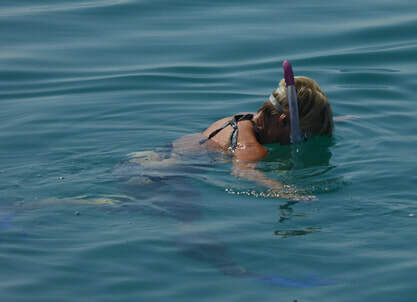 The sea was kicking up and Lindsey's nerves hadn't yet return and she was anxious to be tied to land. Con had the notion that we could tie onto the swimming pier. 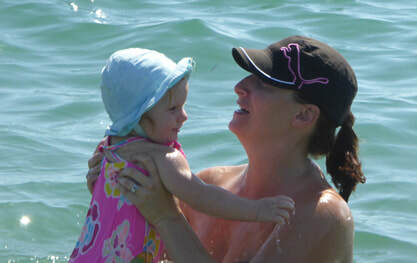 We negotiated Big Sky through the waves toward where dozens of kids were jumping off and swimming everywhere. Once within a few meters, we aborted that idea, seeing it was too dangerous to go closer with the kids continuing to jump. Besides the depth was getting iffy. Back to the marina we went, hoping for a protected corner somewhere to anchor. Once inside the breakwater, the harbour master waved us over to the fishing pier and helped us manoeuvre Big Sky into a 15.2 meter spot (we're 15.2 meters!). Thanks to a long electrical cord and extension cord, we had power once again. 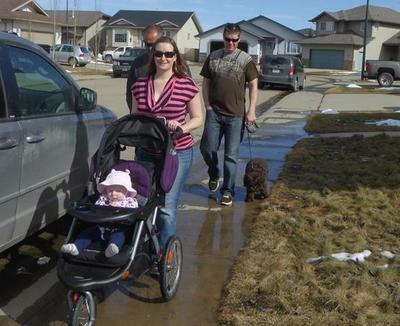 The next day, we drove our family to a hotel near the airport for their early morning departure back to Canada. They had the last room! We tried to book a nicer place, but everything had been booked more than a week and a half before. We drove to the Lidl or “The D’Lidle” as Lindsey called it innocently. She’d only repeated what she heard Con say (with his Dutch accent where “th” ends up “da”, he’d say, “We’re going to da Lidl. We left our sardine-tight space in the morning, zig zagged through the fishing boats, seeing fish nearly jumping into their boats! The large lion-main-like jellyfish (I think called thimble) have arrived. It's their time of the season and in places, it’s thick with them. September 9 -- Fish! Tuna! Seals! Dolphins! and Meltemi's! We left the "fingers" heading south through the Cyclades to enjoy Greece’s “small summer” or as North American’s call it, “Indian Summer”. Let’s hope no one is offended by the word “Indian” summer. It’s origins aren’t knows: Either it’s from the North American Indians burned the prairies in the fall creating a red sky; or because they harvested their crops in the fall when the leaves turned red; or it was the heavy trade to India that took place in the fall. We’re sailing through the meltemi season, but by the end of the month, they should blow themselves out. Our first day sailing south, we tucked into a beautifully protected bay surrounded by goats and one enormous yacht called "Jaguar". I woke at night, hearing something hitting the stern hull. Pointing the flashlight into the dark night waters, I was startled at the numbers of fish. Long pointed-nose eel-like fish, fish with side fins, big-mouthed fat fish gulping air, red fish, small black fish. Over my shoulder, I looked at Jaguar seeing every light on including the underwater lights on, red, yellow, blue, and white lights, like the circus had entered the bay. By morning, we continued south enjoying the water colour changing to a more brilliant blue. A sweet-looking seal poked his head out to watch us and then disappearing quickly with his unique tail slithering smoothly below the surface. Moments later, we motored through a school of tuna, leaping and making quite a ruckus in the water, attracting many gulls, and then, the dolphins arrived, maybe 30 to 40 of them. They surrounded us leaping for speed to get into position to ride the bow, squeaking and turning over to watch us. A few minutes later, the largest one cut a path across the others from our port side to starboard and took his/her leave. The others followed. 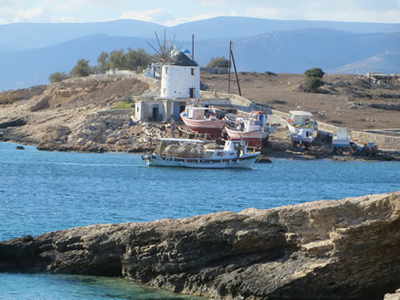 We used the motor and at times sailed yesterday on our eight-hour trek to Kastri, east side of Ivia island. The meltemi was blowing hard, gusting to 40 knots, but where we dropped anchor was calm and we enjoyed a blissfully quiet night. This morning, we braved the meltemi, but it wasn’t too bad, with 30 knots blowing from behind on a calm sea. We’re glad we left, since stronger winds were arriving and would have kept us there longer. Our next stop was Kea Island, officially landing us in the Cyclades. We continued to a beautiful anchorage on Kithnos to hang out while the meltemi blows. 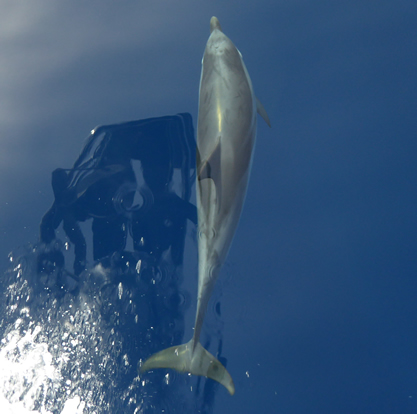 Below: a short video of the beautiful dolphins joining us at the bow. September 11, 2015 Happy birthday to Katelyn, our youngest grandchild turns one today. 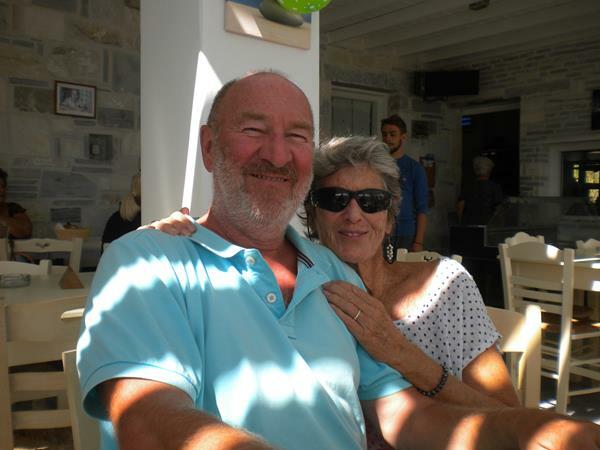 Con and I have been at the quay in Karystos, on the island of Evia for a few days, waiting for the right winds to take us to Syros. We’re keeping a step ahead of the meltemi’s, as another big blow is coming in a few days. Evia is the second largest Greek island (Crete takes the blue ribbon) and our last stop in the Sporades mostly untouched by tourism. 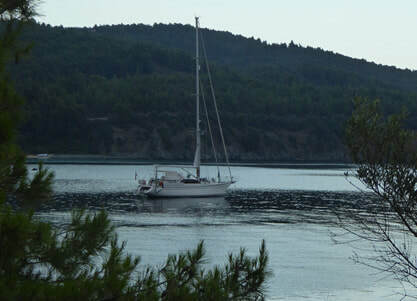 We anchored in Kastri, but with no internet moved one NM further, dropped our Bruce and backed to the quay in Karystos. A local whom we believe has appointed himself harbour master caught our lines and helped us with our paid electrical card. We gave him five euros. Power is somewhat sketchy, going off and on often. Some say, "That's Greece." 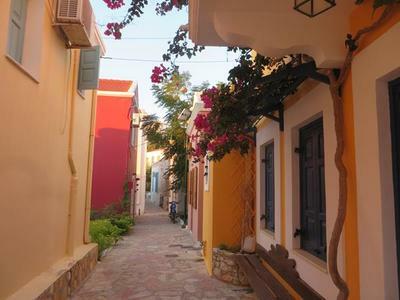 Karystos is a 19th century town, not the white-washed Greek style architecture, but still appealing. September 12 – Welcome Bryant to our family! 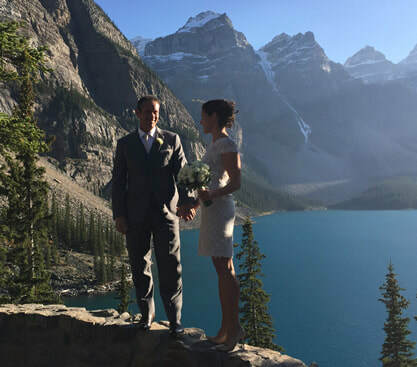 He and Nick married in a private ceremony in Banff. 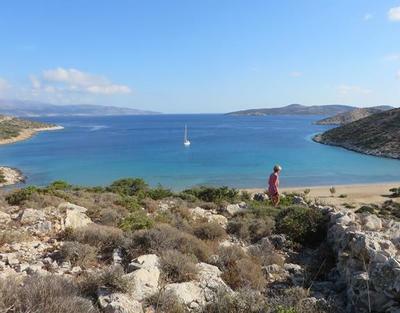 We moved on to Syros Island with smooth seas and gentle winds off our stern, but not for long. The dreaded meltemi caught us blowing so hard from behind that at times we were soaring down waves at 10 knots! Con reefed the sails and we both settled into the trip listening to the VHF call out two separate May Day's. A vessel just north east of us (just out of our VHF range) was sinking (details not known). We were able to hear the coast guards transmissions only. They finally confirmed the location from a distressed captain, as we heard the coast guard say many times, "Calm down captain and give me your latitude," and rescue was made for the two passengers. A few moments later, we heard another May Day message as relayed by the coast guard again. 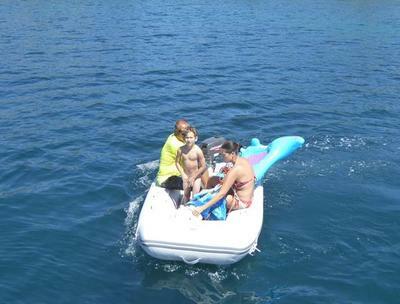 A Man Overboard situation just east of Lesvos (between Greece and Turkey). 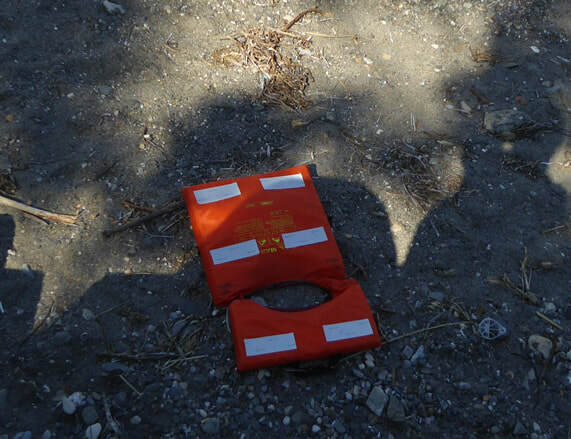 In the morning, we learned that two dinghies filled with migrants overturned. The coast guard rescued 28 people, but the 29th sadly remains missing. 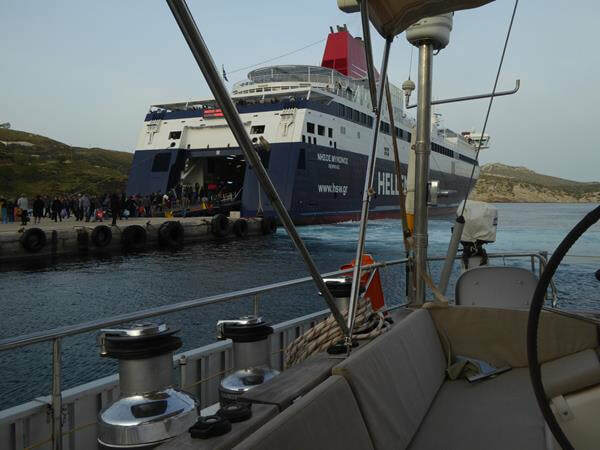 Our protective bay in Syros kept us safe as 20-30 knot winds blew around us. 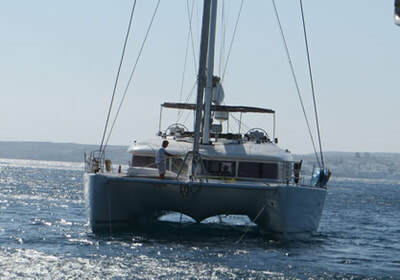 Judy and Bruno aboard Pacific Pearl (pictured below) had arrived just before us and dropped anchor. 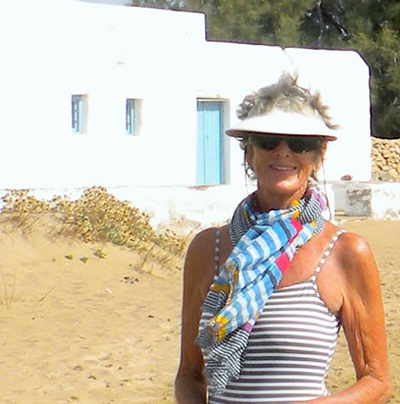 We're both heading south (Pacific Pearl to Crete for the winter and us to Cyprus). Sea temperatures are still warm, 29.5 as Con checked the anchor yesterday. We tied the orange anchor ball to our anchor. The meltemi is doing what it does, racing down the Aegean through the Cyclades keeping boaters in sheltered bays, like us. The sail was too vigorous for me! Wouldn't you know it, while under sail, a freighter was on a collision course with us. (Pictured above.) Con not wanting to risk an unsafe situation decided to pull in sails. We were experiencing gusts to 40 knots! We centered the boom so we wouldn't jibe, and went behind the boat, seeing the faces on the crew at the stern and then seeing their anchor ball. I’m glad of the confusion because it forced us to pull in the sails before the bigger winds made it more difficult. We were now receiving gusts over 50 and a building sea. Once we rounded the northern tip of Paros we were able to take in our main and prepare to anchor. 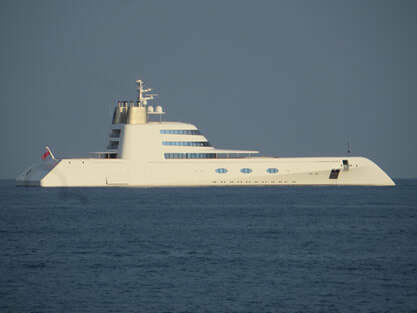 Many boats, and two mega yachts were at anchor. It was difficult holding Big Sky on the spot to drop Bruce in the winds. Surprisingly, a few boats come and go from our protected bay as the wind blows furiously outside. Gusts are reaching 30 knots. Today, we put Little Sky (dingy) into the water. Smartly we tied it to the rail and then slipped it overboard, keeping it tied securely at the bow with a long lead. Con handed me the shortened end of the painter (rope) and said, "Hold it." Before he said, "it" Little Sky burned through my finger and flipped upside down. After making a great rescue, I climbed in for weight, we lowered the engine, and set off for shore arriving completely soaked from the waves splashing over. We hiked the hills, walked through the resort, stopped for a delicious lunch, and then hiked to the top of the hill for a peek at the sea. It's nasty! Large white caps. We're not going anywhere for the next few days. It appears this will be a seven-day meltemi. 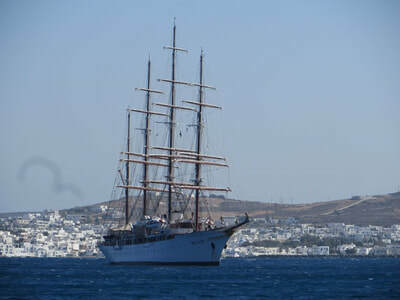 The famous Tall Ship Sea Cloud surprised us entering the bay, dropping anchor behind us and in front of the pretty white-washed town of Naousa, Paros, leaving at first light. 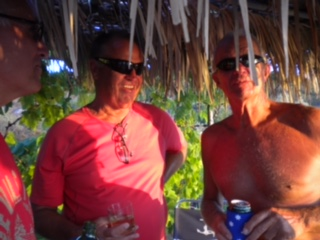 As the sun was setting, we were more surprised when an enormous catamaran anchored off our starboard side, especially when we spotted our friends, and past neighbours from Limassol, Cyprus aboard. 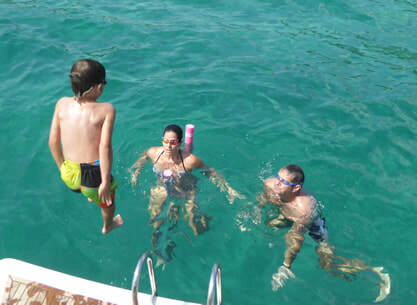 Captain Albert, First Mate/Diver Alejandra (Sasha), and cook Monica aboard Anakin. The owners are in Kazakhstan. 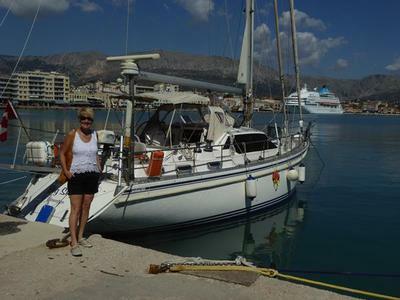 They had a miserable 14-hour sail from Kos. Monica had fallen and was unable to walk, which required her to lay down the entire journey. Needless to say, the crew was famished when they arrived. On our way back to Big Sky from our land tour, we stopped at the sail boat Jad at anchor in front of us, friends of Judy and Bruno. They invited us aboard for a drink, which we kindly declined, as our boat would flip without one of us sitting in it. We carried on to another neighbour in a small sailboat, planning to sail to Israel, but they do not have internet aboard. We promised to give him a weather report in the morning, and every morning until one of us leaves. They also invited us aboard and for dinner, which we kindly declined there too, since again, Little Sky would flip over in these winds. Our last stop was to Anakin, to visit our friends. 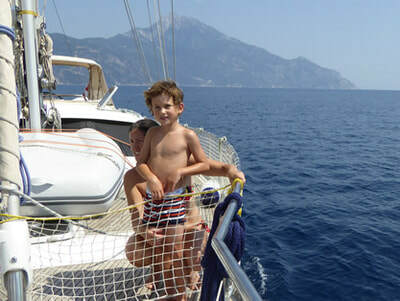 Con remained in Little Sky talking with Sasha and Albert while I followed Monica aboard who filled up a bag with various foods that she says they won't be able to use before putting Anakin on the hard in Athens, their next destination. She also shared the name of an organization in Kos which is helping the thousands of migrants awaiting transport to another country. Con and I are toying with the idea of a stop there for the purpose of providing some help to the migrants. 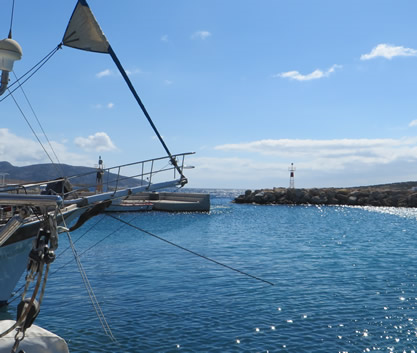 Below: our friends aboard the yacht; the tall ship with Naxos behind; our anchorage during the meltemis; octopus drying in Naxos. While tucked away in protected bays (Naousa and Irakelia) storms have been developing around us and for the most part missing us. Not so for our friends on Skopelos, when the rain flooded the streets near the harbour and this happened. 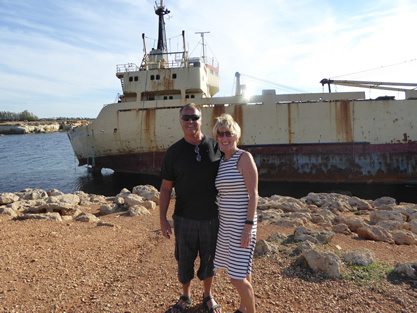 Their boat was covered in run-off dirt when the harbour depths changed. In fact, a giant ice cream freezer was floating in the harbour. 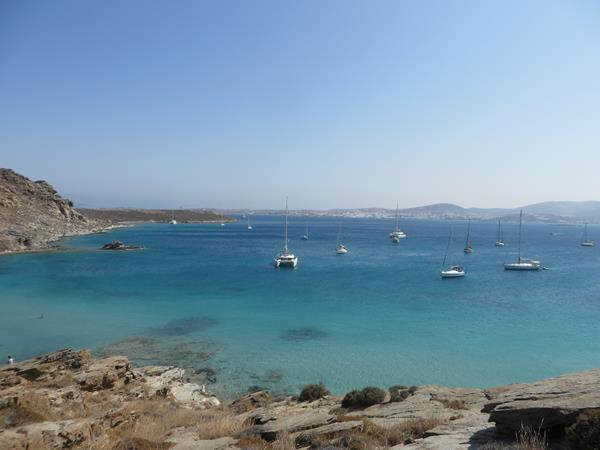 (See photo above) We moved from Paros to the island of Irakelia and dropped anchor. This island's population is less than 200 without tourists gone. It's incredibly peaceful. Birds singing. We went ashore and hiked up to some old ruins testing our feet on shaky stones as we had to create our own paths down. Storm clouds continue to circle us and we slip from anchorage to anchorage. We moved from Irakleia to Skhinousa, part of a small chain of islands south of Naxos. They're beautiful! Population minimal. Our first stop was at a small harbour quay where the ferry arrives each day. A local woman kindly offered to drive me to the chora (town on the hill) for some groceries. Con stayed with the boat in case we had to move. I circled the store twice looking for something, anything we could buy to restock our fridge. The milk was 3.5 percent fat, so I passed. I found packaged of cheese, since we were dangerously low, worthy of a Dutch-boy's panic. The lady pointed for me to walk further up the narrow road to the bakery and she waited by her car. There, I managed to buy milk, two days passed the due date, bread and a spinach pie. Back aboard, we motored into a bay protecting us from anticipated north winds. Tomorrow is the first day for some of the island to experience 23 percent VAT (tax) as part of the austerity program the EU imposed on Greece. The islands have been benefiting with lower taxes to encourage tourism. We're okay to pay our fair share. The meltemi arrived with more strength expected tonight and tomorrow. Yesterday, we secured Big Sky in a very small marina on the south end of Koufonisi Island. The marina is square shaped, roughly four Big Sky's long and across. 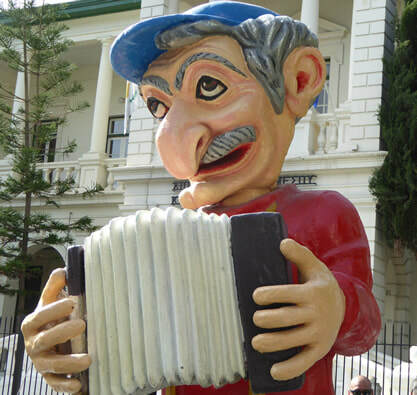 An old Greek man is in charge. He operates four fishing boats converted to tour boats which taking up a quarter of the marina. Real fishing boats take up about half the marina, leaving about a quarter of the marina for visitors. A teenager spotted us entering and quickly untied his small wooden boat relocating it to the only spot available, using the pick-up line, he turned to us and shouted, "Go there!" Pointing to a less than okay location for a boat our size as it experiences surges. We went, "there." When the old guy arrived on the scene, he took one look and had us move in where the small boat was and shifted him aside. Our very-muscular Austrian neighbour aboard a catamaran said we should secure our lee side. We both nodded agreement but didn't know how since there wasn't another pick-up line. The small village of Koufonisia is situated beside the marina (pictured below). The old man said, “Oh, 15 euro for week is good." That included power and water! We filled our water tanks, have been washing clothes and towels, comforters, all our summer stuff, baking banana bread, and cooking meals all the while the wind is blowing 30 knots around us. October 5-12 --Count down was on, for our departure through the Dodecanese islands, including the two day (40-hour) non-stop trek to Cyprus. Weather patterns had been different this season and we needed to get to Cyprus before the strong southerlies would block our safe transit. They were forecast to arrive and were moving across the Mediterranean toward the path we would be sailing, leaving us not a lot of breathing room. This summer and fall, there were many more meltemis than in the past and in fact, hurricane-like conditions hit the islands a few times, missing us. Many times we had to quickly tuck into protected bays and mini-sized islands at protective quays. We dropped anchor in clean, clear water and backed up to the quay. For five euro, we have as much power as we use. Winds are still strong, and we stayed six days. 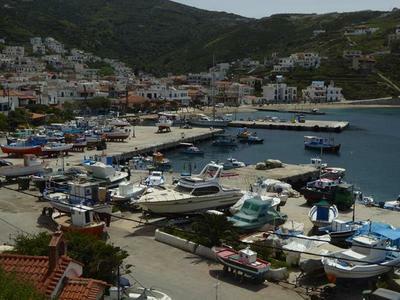 The harbour and surrounding village is quiet and cozy. 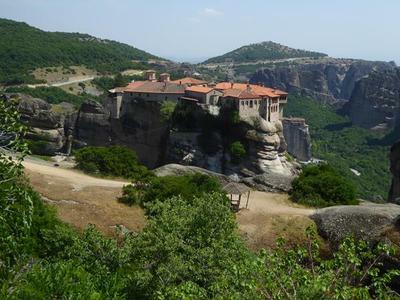 The chora (town on the cliff) sits above giving it the distinct look. Astypalia, the furthest eastern Dodecanese island is shaped as a butterfly. When we left Koufonisi, we left the Cyclades Island chain. 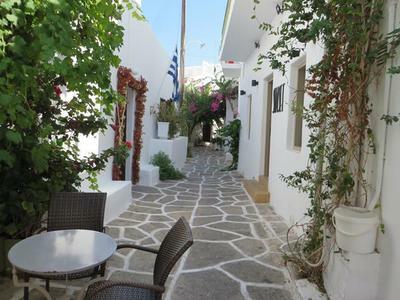 The Dodecanese have a more traditional "Mediterranean" look, with the pastel-coloured houses, however, Astypalia is the exception with its strong Cyclades sugar cube white and blue look. 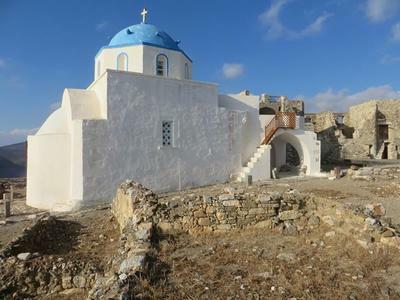 The castle on the hill was once the fortification to protect the Christians from pirates. Back in the day, when Turkey controlled the islands, they collected the taxes, but left the people to fend for themselves. 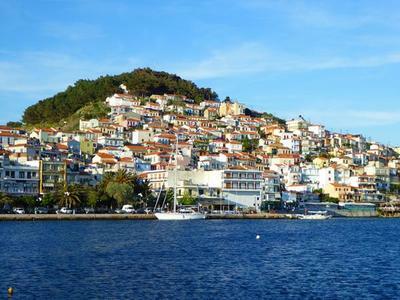 The town was built from the castle across the hillside and down to the harbour. 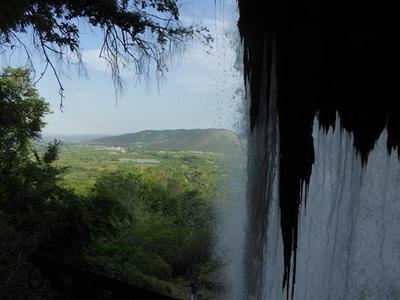 This is the view from inside the castle on the hill. 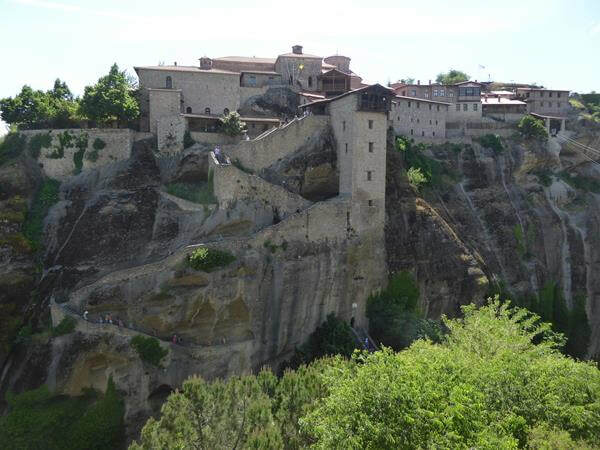 In 1956, a bad earthquake destroyed most of the stone houses around the castle. 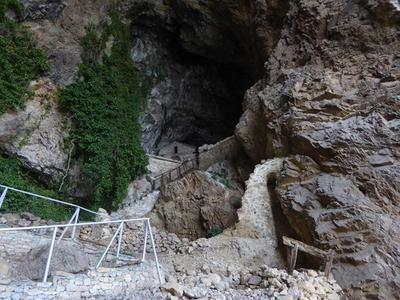 The government decided it was too dangerous to rebuild them, even for tourism because they'd shake, rattle and fall in another earthquake in the future. 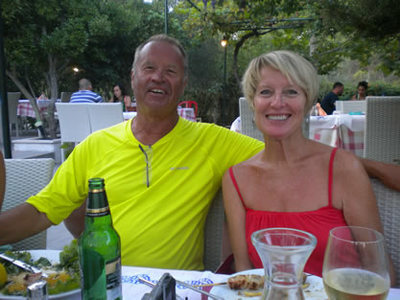 Judy and Bruno arrived and almost immediately left for Crete learning of Judy’s mom’s ill health. She needed to fly quickly to Cairns, Australia. 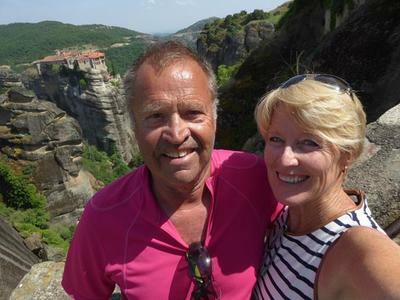 sadly Judy made the decision to fly to Cairns, Australia to help her mom and Ejner and they left for Crete. Dodging warships we arrived in Chalki, the island that makes us smile. It’s where we were when grand daughter Kate was born, but it’s also a gorgeous place surrounding by turquoise waters and colourful Greek houses. Since the southerly’s were building shrinking our time frame to get to Cyprus, we left the next morning right after the bakery opened and Con got a spinach pie. We dropped anchor in the protected bay on the east side of Rhodes Island leaving at 1 am for our 38-hour crossing to Cyprus. The weather kicked up the sea for the first third of our journey, making a lumpy and uncomfortable ride. On the tenth hour we set sails providing some stability. The forecast southerlys had moved east closing in on our path, but we were beating them. As night moved in, there wasn't a cloud in the sky, just the stars magnified overhead with the milky way cutting a path through the centre. The first night on my watch, I spotted two bright red dots straight ahead in our path, but nothing appeared on the RADAR. Mystified, I climbed topside to investigate and saw the lights were the points of the upside-down crescent moon rising, just barely above sea level. The second night, the moon didn't appear at all. I’m always on guard for what I can’t see in the night. Watch is done from inside our pilot house with the RADAR going and 20-minute 360 topside scans topside with my head over the dodger. I felt prone for the unknown with my face open to the wind in the pitch black night. 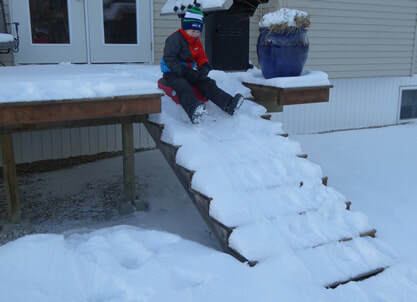 I slipped back inside. Closing in on Cyprus, we picked up radio communications from Israel and Lebanon. 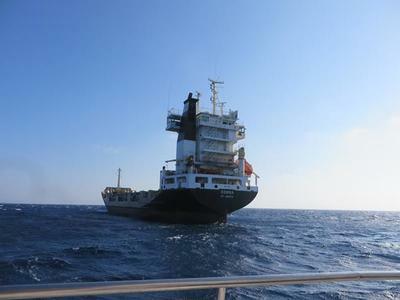 At one point, it was tense when a vessel was within 5 NM of Lebanon's territorial waters. In those waters, it’s mandatory for all vessels to announce themselves at 12 NM out requesting access. The Lebanese Navy called them every minute for response, but no one responded. We held our breath. The silent vessel changed course, but never responded. October 28 -- "Oxi Day"
Temperatures hovered in the low 30s on the Greek “Oxi Day” (No Day). October 28, 1940 was the day the Greek people were given the ultimatum by Mussolini to allow the Italians to occupy strategic areas in Greece or be invaded. The reply: "Then this is war!" 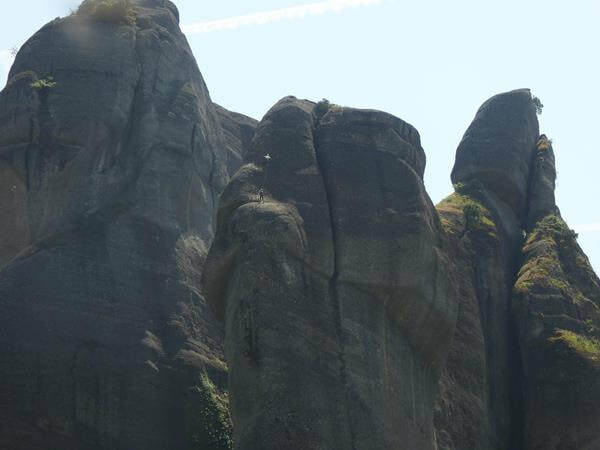 The Greeks then entered WWII and every year thereafter, on October 28th, the Greeks shout out, "Oxi!" 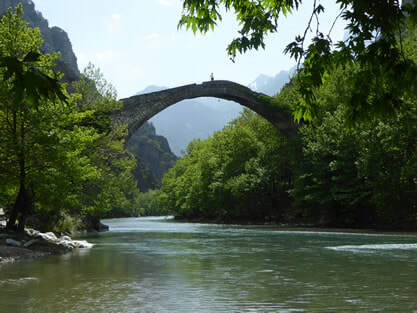 The Italians entered Greece through the Pindus Mountains (between Albania and Northern Greece) and were quickly defeated by the Greeks. Cycling around the city picking up daily groceries, pastries from Le Croissant Bakery, and checking the happenings at the water front, we stopped to view the Police event on waterfront promenade. The police had marching bands, cheer leaders, games for kids, speeches and awards (in Greek). 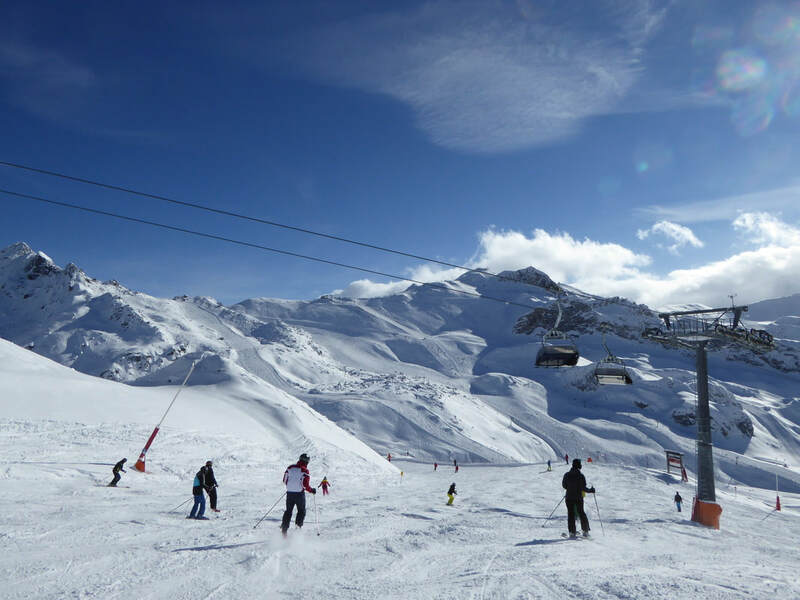 Maintenance for both Big Sky and our bodies is now completed for the winter season with the help of professionals. Following our dental checkups, we visited a dermatologist to check our sun-touched bodies to ensure nothing is growing that shouldn't be there. 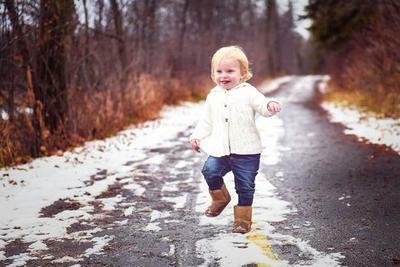 In Canada, a similar visit is covered by our Canadian health system, however, it takes four to six months once your general doctor has approved a visit. We get five minutes each in Canada, which includes dry ice treatments. 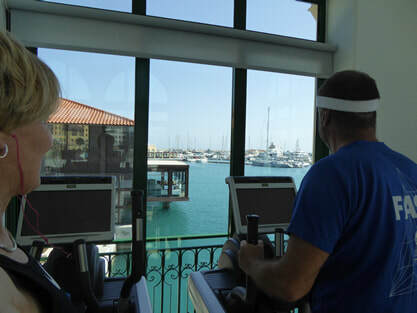 Here, we had 45 minutes each for 50 euro each, and had to return the next day for treatments. Between us, we have about 20 stitches from where bad stuff was cut off. I had one issue on my chest and Con's body looks like a war zone. Pathology has checked all our cut-off pieces and we're fine. 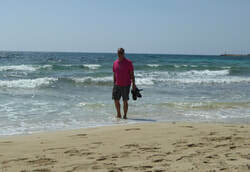 Weather in Cyprus is still registering high 20s, and the sea is filled with people enjoying the water. Tomorrow, we close up the boat for eight weeks while we enjoy family in Canada and the Netherlands. Edros III crashed on the rocks last year during a bad storm.